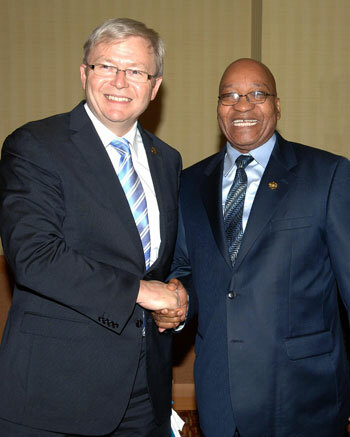 President Jacob Zuma meeting with Australian Prime Minister Kevin Michael RUDD on the sidelines of the CHOGM conference held in Trinidad and Tobago, Port of Spain. 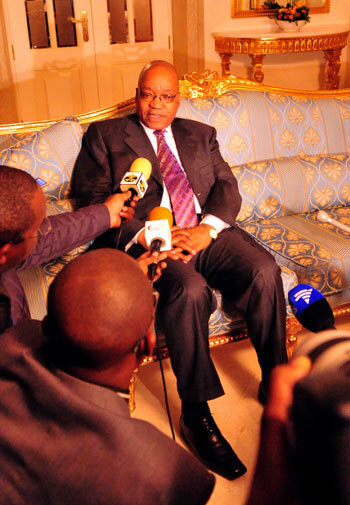 President Jacob Zuma being interviewed on the outcomes of the Commonwealth Heads of Government Meeting (CHOGM) held in Trinidad and Tobago, Port of Spain. 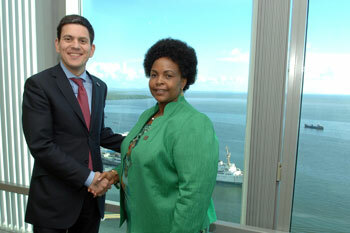 Minister of International Relations and Cooperation, Ms Maite Nkoana-Mashabane meeting with United Kingdom Foreign Secretary David Miliband on the sidelines of the CHOGH conference in Trinidad. In the background is the bay of Port of Spain, Trinidad and Tobago capital city. 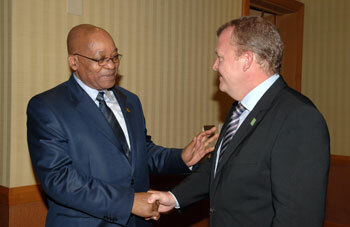 South African President Jacob Zuma meeting with Denmark Prime Minister Mr Lars Rasmussen for bilateral talks during the Commonwealth Heads of Government Meeting held in Trinidad. 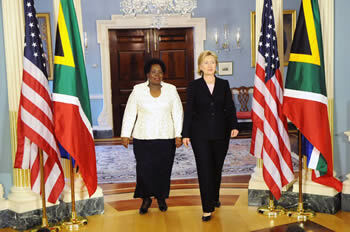 President Zuma is supported by International Relations and Cooperation Minister Ms Maite Nkoana-Mashabane. President Jacob Zuma with Secretary General of the United Nations Ban Ki-Moon on the sidelines of the Commonwealth Heads of Government Meeting held in Trinidad and Tobago. 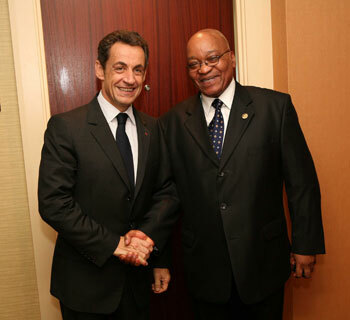 President Zuma shake hands with President Sarkozy. 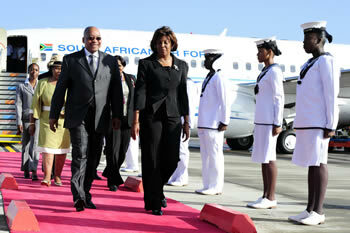 President Jacob Zuma and Mrs Gertrude Sizakele Khumalo Zuma arrives in Trinidad and Tobago, Port of Spain to attend the Commonwealth Heads of Government Meeting (CHOGM).The President is recieved by Trinidad Foreign Minister Ms Paula Gopee-Scoon. 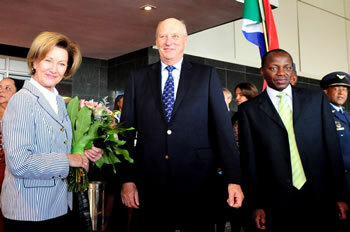 His Majesty King Harald V and Queen Sonja of the Kingdom of Norway arrive in OR Tambo International, Johannesburg, 23 November 2009. 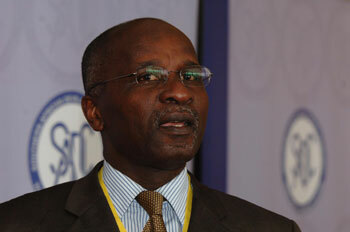 Picture: Unati Ngamtwini. 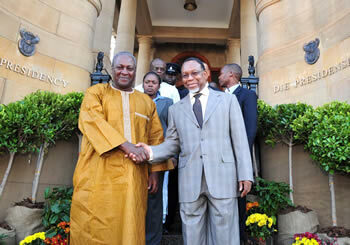 Deputy President Motlanthe arrives in Abuja Ahead of SA-Nigeria BNC, 10 year celebration with South African High Commissioner to Nigria JNK Mamabolo, 14 November 2009. 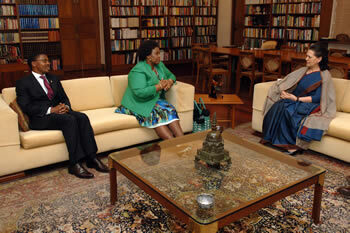 Minister of International Relations and Cooperation, Ms Maite Nkoana-Mashabane with Sonia Gandhi, President of the Indian National Congress Party. 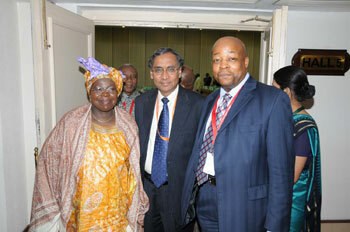 Far left is South African High Commissioner to India, Mr Francis Moloi, india. 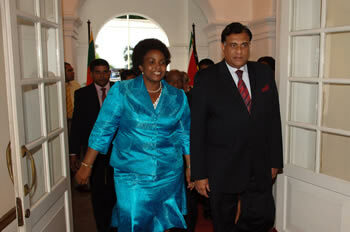 International Relations and Cooperation Minister Maite Nkoana-Mashabane with Indian Minister of External Affairs, Shri S M Krishna, India, 15 November 2009.
International Relations and Cooperation Minister Maite Nkoana-Mashabane walking with Sri Lankan Foreign Minister Rohitha Bogollagama, Sri Lanka, 11 November 2009. 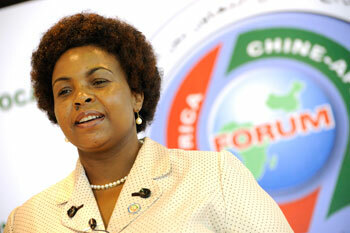 Minister of International Relations and Cooperation Ms Maite Nkoana Mashabane at the FOCAC conference. 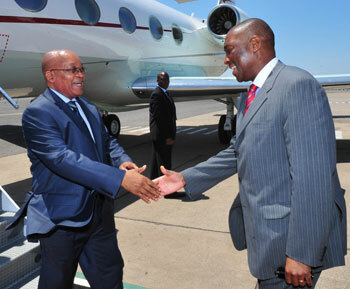 President Jacob Zuma is welcomed by Minister Oldemiro Baloi, Minister for Foreign Affairs and Cooperation. 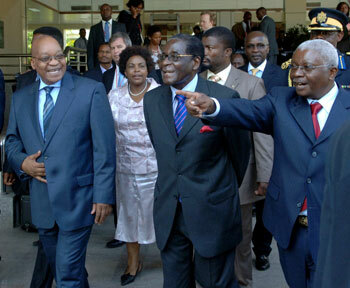 President Gabuza with Presidents Zuma and Mugabe at SADC Troika in Maputo, Mozambique. 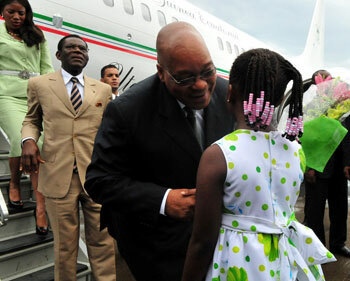 President Jacob Zuma recieves flowers upon arrival in Malabo Equitorial Gunea. 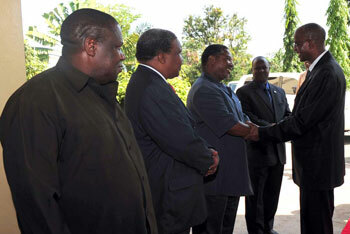 Presidents apploude at the conclusion of the signing of the MOU's in Malaba, Equitorial Gunea. 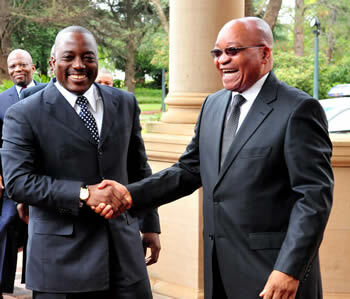 President of South Africa Mr. Jacob Zuma welcomes President of DRC Mr. Joseph Kabila before the SA-DRC BNC, Pretoria, 30 october 2009. 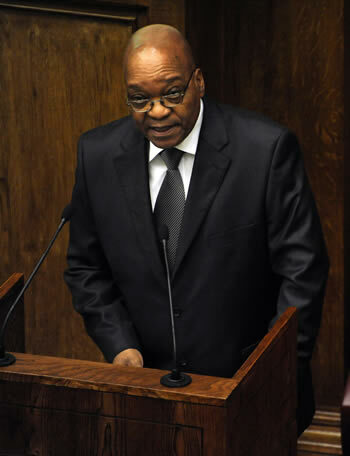 President Jacob Zuma addresses the National Council of Provinces (NCOP) in Parliament under the theme "Together finding solutions to achieving the goal of a better quality of life for all", 29 October 2009. 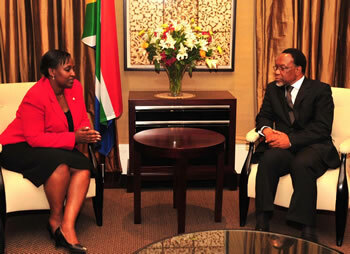 Minister of International Relations and Cooperation Maite Nkoana-Mashabane welcoming the President of DRC Joseph Kabila at the OR Tambo upon arrival, 29 October 2009. 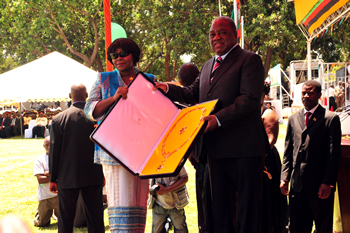 President Ruphiah Bweza Banda bestowed the Order of the Eagle of Zambia on to OR Tambo, Tembi Tambo was also invited to accept it. 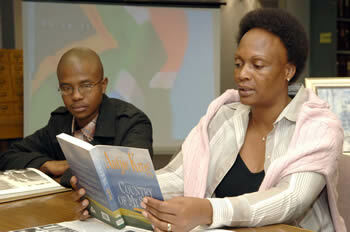 Minister of International Relations and Cooperation, Ms Maite Nkoane-Mashabane presents a lecture at an imbizo outside Polokwane in Limpopo, 16 October 2009.
International Relations and Cooperation’s Director-General Dr Ayanda Ntsaluba briefs the Media on current International Developments, 13 October 2009. 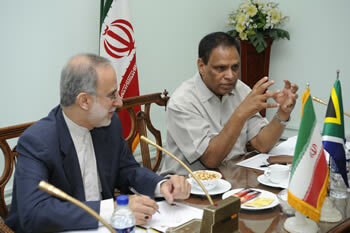 Deputy Minister of International Relations and Cooperation, Mr Ebrahim Ebrahim meeting with Iranian Foreign Minister Mohammed Bageri, 28 - 29 Septmber 2009. 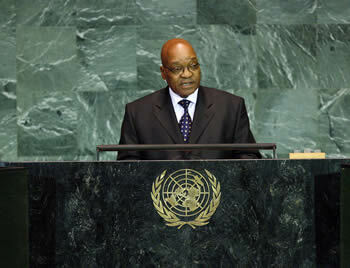 President of the Republic of South Africa, Mr Jacob Zuma, addresses the General Debate of the Sixty-Fourth Session of the General Assembly, United Nations, New York, 23 September 2009. 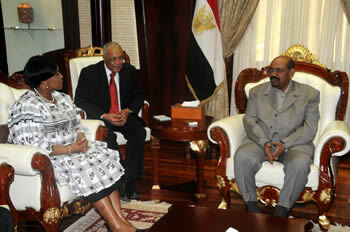 Minister Maite Nkoana-Mashabane and Minister Chabane pay a courtesy call on President Omar El Bashir of Sudan. 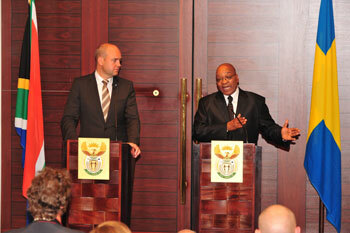 President Jacob Zuma makes a point as Swedish Prime Minister Fredrik Reinfeldt listens tentativerly during the press briefing. 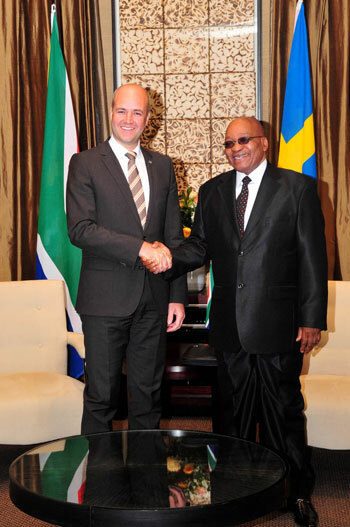 President Jacob Zuma shaking hands with Swedish Prime Minister Fredrik Reinfeldt in Tuinhuis. 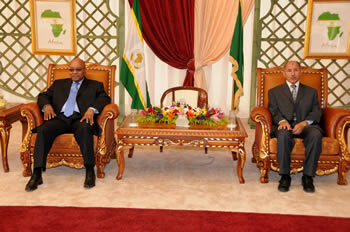 President Jacob Zuma with Swedish Prime Minister Fredrik Reinfeldt upon arrival at Tuinhius. 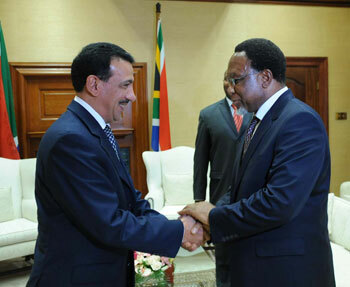 Deputy Minister Ebrahim Ebrahim receives Credentials from NEPAD Secretariat CEO. Minister of International Relations and Cooperation, Ms Maite Nkoane-Mashabane is welcomed by Brazillian Foreign Minister Celso Amorim for the IBSA Ministerial meeting taking place in Brazil. Department of International Relations and Cooperation Director-General Dr Ayanda Ntsaluba briefs the media on South Africa’s handover of SADC chairship next month. 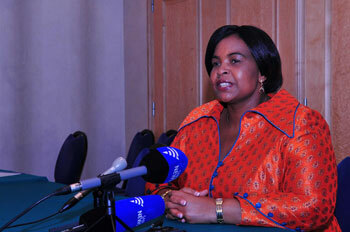 Minister Maite Nkoane-Mashabane briefing the media about the Angola state visit. 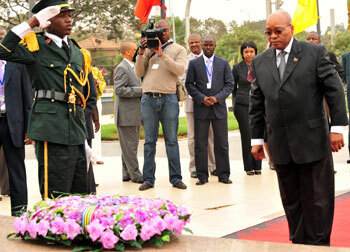 President Jacob Zuma lays a wreath as he pays respect to Angola's past President, Augatos Nato. 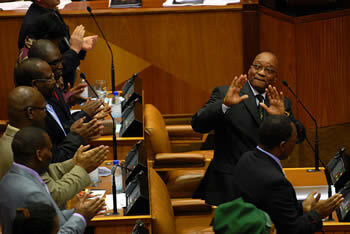 President Jacob Zuma & President Dos Santos clap hands during the press briefing. 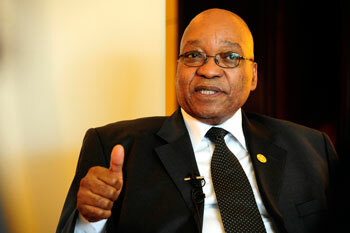 RSA President Jacob Zuma gestures as he makes a point during a press briefing on the importance of the Angola State Visit. 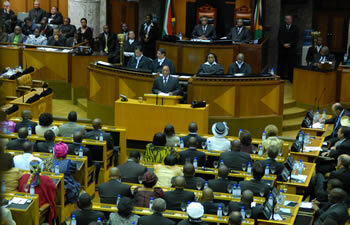 President Jacob Zuma addresses the national assembly. 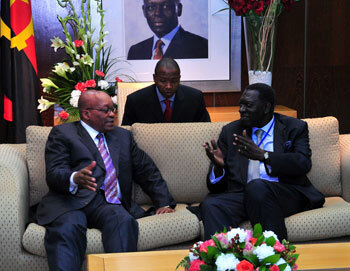 Minister Dos Anjos chats to RSA President Jacob Zuma as he arrives in Luanda, Angola. 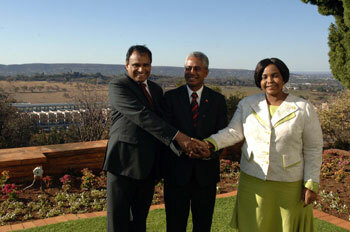 Left to right: Deputy Minister Ebrahim Ebrahim, Timor-Leste Foreign Affairs Minister Dr Zacarias da Costa, and Minister Nkoana-Mashabane. 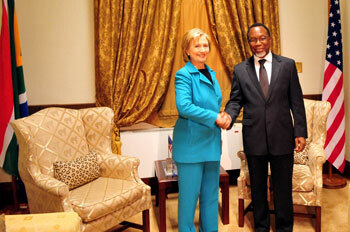 US Secretary of State Ms Hillary Clinton pays a courtesy call on Deputy President Kgalema Motlanthe at the Union Buildings, 07 Aug 2009. 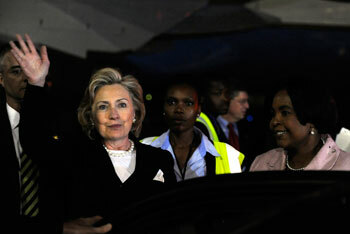 United States of America Secretary of State, Ms Hillary Rodham Clinton arrive at OR Tambo International Airport In Johannesburg, South Africa. 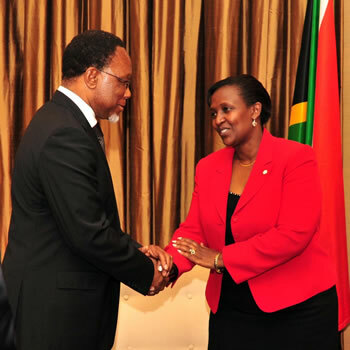 She is received by South African Minister of International Relations and Cooperation Ms Maite Nkoana-Mashabane, 6 August 2009. 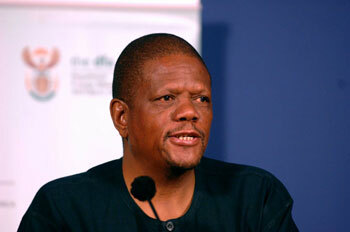 Dr Ayanda Ntsaluba Director General of the Dept. of International Relations and Cooperation briefing the media on current international issues that South Africa is interacting, Pretoria, Union Building, 30 July 2009. 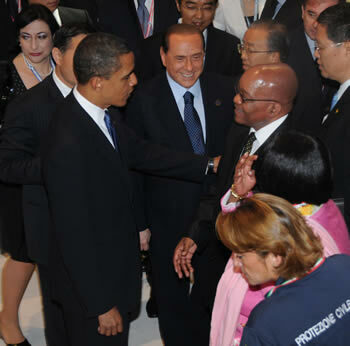 President Zuma meets with President Barak Obama , President of the USA, during the G8 plus G5 at the start of the G8 Summit in Italy. 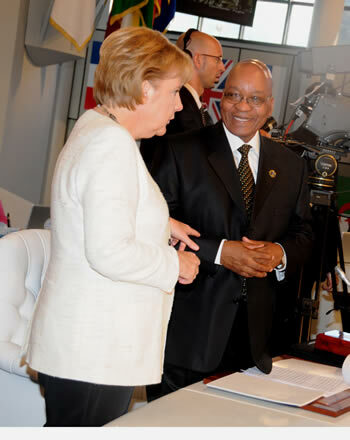 President Zuma chats with German Chancellor , Ms. Angela Marcel. 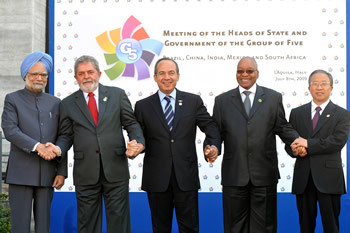 President Jacob Zuma with some members of the G5 in Italy, 8 July 2009. 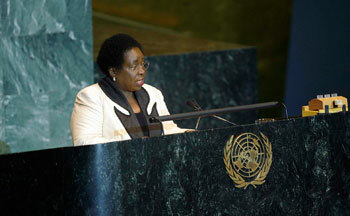 Minister Mashabane presenting her speech during the Financial meeting at the General Assembly of the UN in New York. 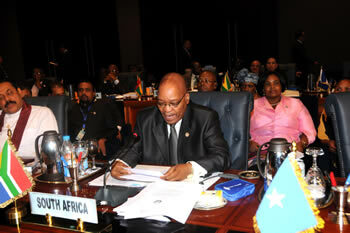 President Zuma attends the APRM meeting ahead of the AU Heads of State Summit in Sirte ,Libya. 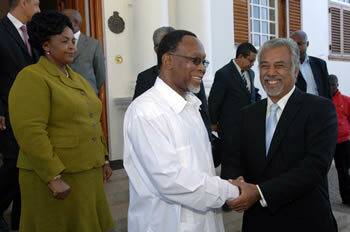 Deputy President Kgalema Motlanthe of South Africa recieve East Timor Prime Minister Kay Rala Xanana Gushmao, with the Minister of International Relations and Cooporation, Ms Maite Nkoana-Mashabane, Pretoria, 31 May 2009. 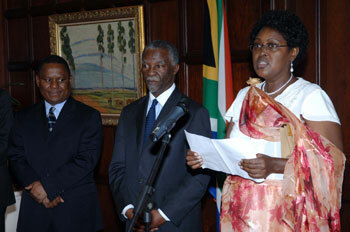 Minister of International Relations and Co-operation Maite Nkoana-Mashabane at a media briefing Union Buildings, Pretoria, 14 May 2009. 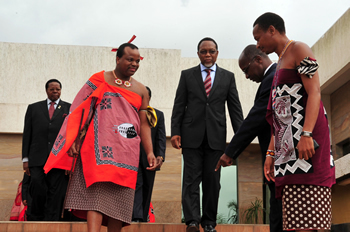 King Mswati and South African President Kgalema Motlanthe being directed by Dr. Solamao where to stand in a SADC Extra-ordinary meeting in Swaziland, 30 March 2009. 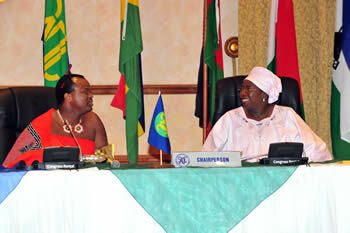 King Mswati and Minister of Foreign Affairs Dr. Nkosazana Dlamini Zuma at SADC Extra-ordinary meeting in Swaziland, 30 March 2009. South African Minister Dlamini-Zuma and Rwanda Foreign Minister Rose Museminali address a press briefing after the Joint Commission held at the Grooteschuur house in Rondeboch, Cape Town. 25 March 2005. 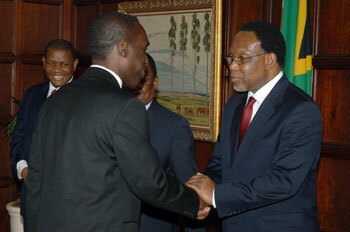 President Kgalema Motlanthe with Rwandan Foreign Minister Rose Museminali in Cape Town, 25 March 2009. 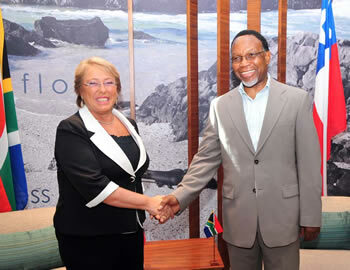 President Kgalema Motlanthe greets Chilean President HE Michell Bachelet before their meeting in Cape Town. 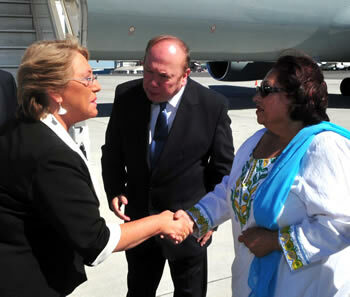 Chilean President HE Michell Bachelet is greeted by Deputy Minister of Foreign Affairs Fatima Hajiag upon arrival at the Cape Town International. 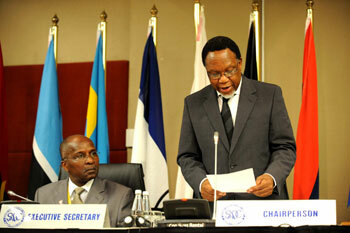 RSA President Kgalema Motlanthe giving a press interview as he departs the conference. 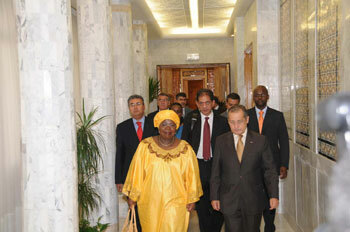 Dr Dlamini Zuma RSA Foreign Minister welcomes UNSG Ban Ki-Moon as he arrives in Pretoria. 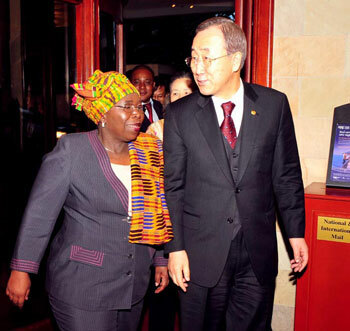 Dr Dlamini-zuma RSA Foreign Minister and UNSG Ban Ki-Moon walking into the Sheraton as the UNSG arrives in Pretoria. 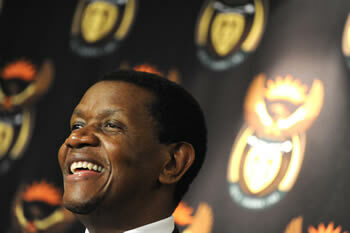 Dr Ayanda Ntsaluba DG Foreign Affairs smiles as he takes questions during a press briefing at the Union Buildings. Prof Athur Muthambara & SADC Executive secretary Dr Augasto Solamao look on as Morgan Tsvangarai takes an oath infront of President Mugabe. 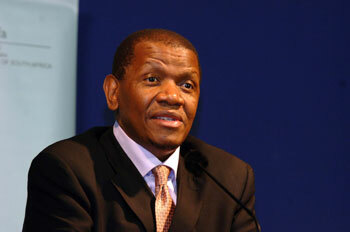 Director General of the Department of Foreign Affairs, Dr Ayanda Ntsaluba briefs media on international events. 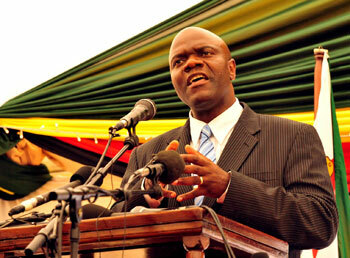 He spoke about Zimbabwe, UK visa request, upcomming DFA events. Deputy Minister of Foreign Affairs Sue van der Merwe signing a Joint Communique with Assistant Foreign Minister for Follow-Up Affairs of the State of Qatar Mr Mohammed Abdullah Al-Rumaihi in her office at Parliament. 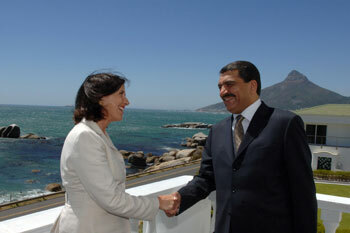 South African Deputy Foreign Minister Sue van der Merwe shaking hand with with the Assistant Foreign Minister for Follow-Up Affairs of the State of Qatar Mr Mohammed Abdullah Al-Rumaihi at the Twelve Apostles Hotel and Spa in Camps Bay, Cape Town on Wednesday 04 February 2009. In the background is Lions Head. South African Deputy Foreign Minister Sue van der Merwe with the Assistant Foreign Minister for Follow-Up Affairs of the State of Qatar Mr Mohammed Abdullah Al-Rumaihi at the Twelve Apostles Hotel and Spa in Camps Bay, Cape Town. (left to right) Director General of Foreign Affairs, Dr Ayanda Ntsaluba, Dean of the Diplomatic Corps in SA Libyan Amb H E Dr A A Alzubedi , Deputy Minister of Foreign Affairs Sue van der Merwe and Foreign Minister Dr Nkosazana Dlamini Zuma opening the New State Protocol Lounge at Cape Town International Airport. Foreign Minister Dr Nkosazana Dlamini Zuma opening the New State Protocol Lounge at Cape Town International Airport with Dean of the Diplomatic Corps and Ambassador of Libya H E Dr A A Alzubedi. 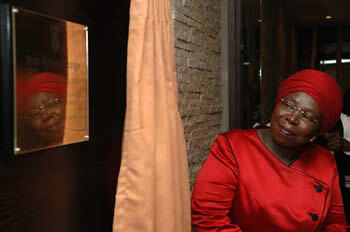 Foreign Minister Dr Nkosazana Dlamini Zuma opening the New State Protocol Lounge at Cape Town International Airport. 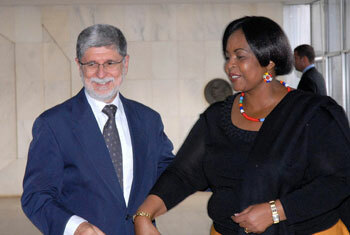 Libya Ambassador to South Africa and Dean of the Diplomatic Corps H.E. 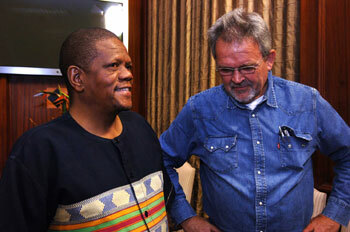 Abdullah Alzubedi talks with Rev Frank Chikane just before the briefing in Pretoria, South Africa. 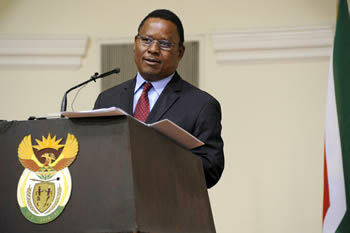 Rev Frank Chikane brief the Diplomatic Corps in South Africa with the SADC Zimbabwe process in Pretoria, South Africa. 1st-Vice President of Burundi, Dr Yves Sahinguvu greeting Minister Nqakula upon his arrival at the consultative meeting of the Burundi peace process in Bujumbura. 1st-Vice President of Burundi Dr Yves Sahinguvugu greeting Amb Mamabolo upon his arrival at the consultative meeting of the Burundi peace process in Bujumbura. 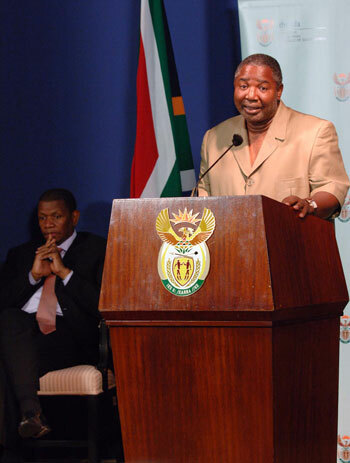 South African Defence Minister Charles Nqakula delivers a speech as 1st Vice President of Burundi, Dr Yves Sahinguvugu and Ugandan Ambassador to the UN, Adonia Ayebare look on. 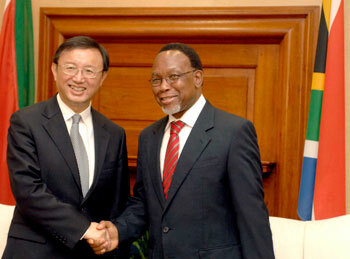 President Kgalema Motlanthe with People’s Republic of China Mr Yang Jiechi. 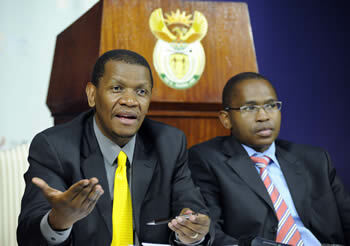 Dr Ayanda Ntsaluba, Director General of the Department of Foreign Affairs briefing media. 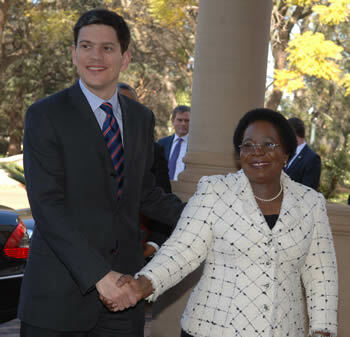 South African Deputy President Baleka Mbete met with Sweden Deputy Prime Minister Mrs Maud Olofsson at OR Tambo House (official residence of Deputy President Mbete) in Pretoria for a breakfast meeting. 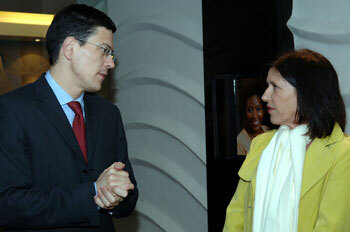 Deputy Minister Sue van der Merwe hosted a farewell lunchen to outgoing US Ambassador Eric Bost at the Lombardy Estate. 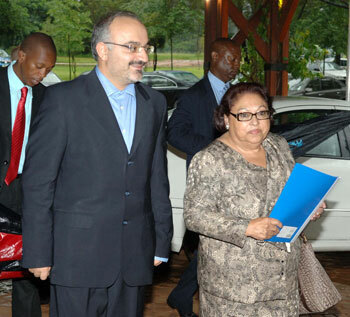 Dr Behrouz Alishihri, the Deputy Minister of Economic Affairs and Finance of Iran with South African Deputy Minister of Foreign Affairs Fatima Hajaig walking together. 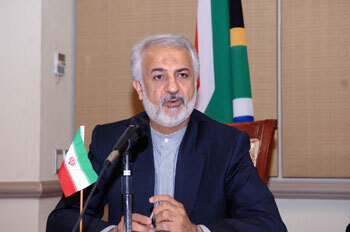 Dr Behrouz Alishihri, the Deputy Minister of Economic Affairs and Finance of Iran with South African Deputy Minister of Foreign Affairs Fatima Hajaig. 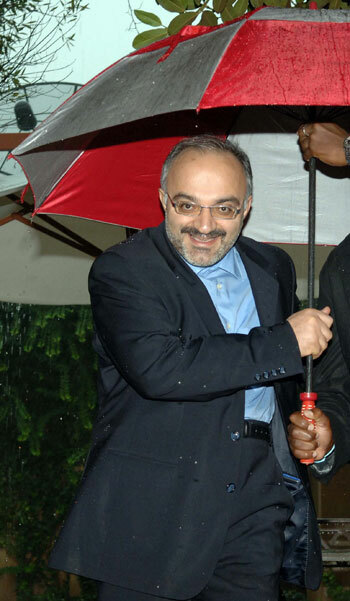 Dr Behrouz Alishihri, the Deputy Minister of Economic Affairs and Finance of Iran in the rain. Ambassador Jerry Matjila, the Deputy Director-General responsible for Asia and Middle East in the Department of Foreign Affairs and Dr Behrouz Alishihri, the Deputy Minister of Economic Affairs and Finance of Iran during discussions. 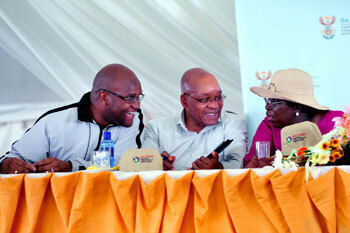 Minister Dlamini Zuma speaking with Minister Nathi Mthethwe and ANC President Jacob Zuma during the Imbizo/End of 16 Days of Activism event heald in KwaMsinga in KwaZulu-Natal today, 10 December 2008. 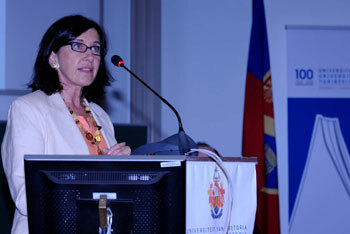 Ms Sue van der Merwe, Deputy Minister of Foreign Affairs presents a look at Multilateralism and the respect for International Law as strategic objectives of South Africa's Foreign Policy at the University of Pretoria. Pretoria University Vice Chancellor Prof C Pristorious at Multilateralism and the respect for International Law conference on Western Sahara at the University of Pretoria. 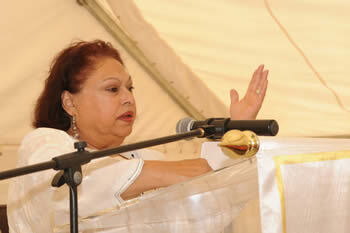 Deputy Minister Fatima Hajiag delivers a speech at the Launch of 16 Days of Activism of the Department of Foreign Affairs, Pretoria, South Africa, 28 November 2008. 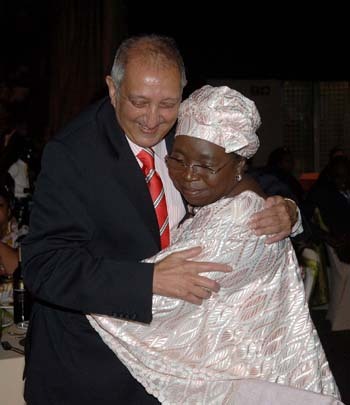 Former Deputy Minister of Foreign Affairs Mr Aziz Pahad with Minister Nkosazana Dlamini Zuma at the farewell function held at Galagher Estate, Midrand. 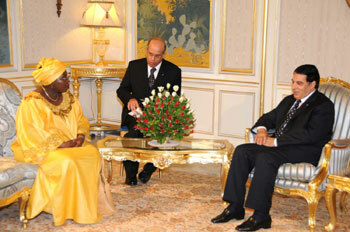 President Montlante recieved HE Amb MM Al-Ali of Saudi Arabia. 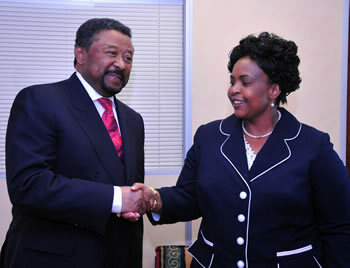 The Ambassador payed a courtesy call on the president at his offices in the Union Building this afternoon. 27 Nov 2008. South African Foreign Minister, Dr Nkosazana Dlamini Zuma and the Russian Federation Minister of Natural Resources and Ecology, Mr Yuri Trutnev during the Inter-governmental Committee on Trade and Economic Co-operation (ITEC) held at the Izulu Hotel in Durban, Kwa Zulu Natal province, South Africa. 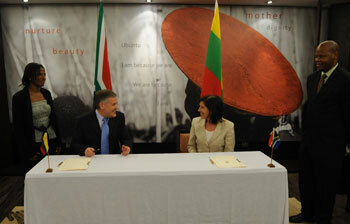 Deputy Minister van der Merwe met with her Lithuanian counterpart Deputy Minister Jusys. The two principals signed a Memorandum of Understanding on the Establishment of a Bilateral Consultation Mechanism between the DFA and the Lithuanian Ministry of Foreign Affairs. 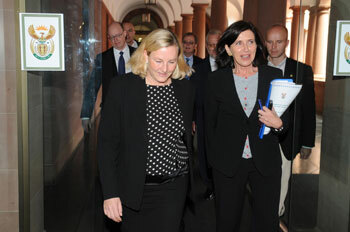 Deputy Minister Sue van der Merwe meeting with Lithuanian Deputy Foreign Minister HE O. Jusys at her residency in Pretoria. 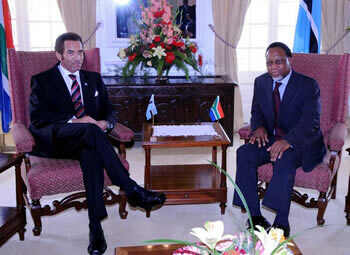 President Kgalema Montlante and President Seretse Khama Ian Khama of Botswana at the Presidential Guesthouse, Pretoria, South Africa, 23 November 2008. 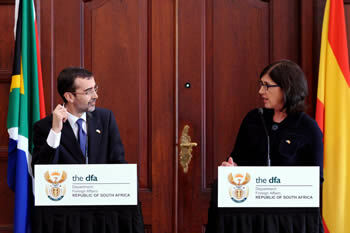 Deputy Foreign Minister Sue Van Der Merwe and Mr Angel Lossada, the Secretary of State for Foreign Affairs of the Kingdom of Spain during the Fifth Annaul South Africa - Spain Consultations, 21 November 2008, Pretoria, South Africa. 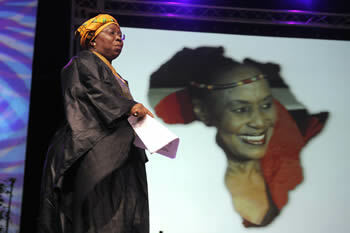 Minister of Foreign Affairs Dr. Nkosazana Dlamini Zuma walks onto the stage to deliver her speech during the memorial service of Miriam Makeba, 15 November 2008. 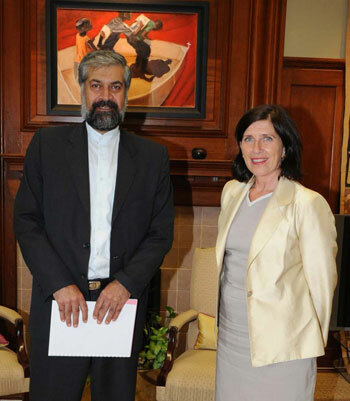 Deputy Minster Sue van der Merwe meeting with HE Morteza Sarmadi, Executive Director of the Indian Ocean Rim Assossiation for Regional Co-operation, at the Union Buildings. 12 November 2008. 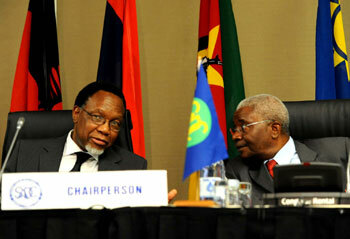 President Kgalema Montlante chating to Mozambique President Amando Emilio Guebuza during SADC Extraordinary summit. 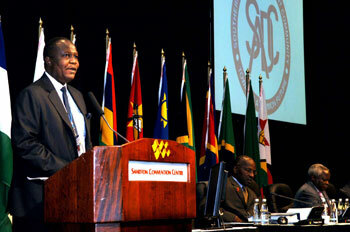 President Kgalema Montlante delivering an opening during SADC Extraordinary summit. 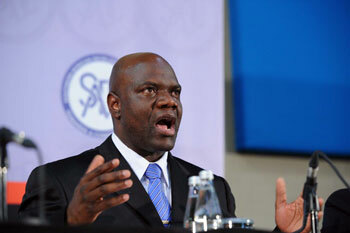 Zimbabwe Deputy Prime Minister designate, Prof. Arthur Muthambara giving a press briefing at the conclusion of the SADC Extrodinatry Summit in Sandton, Johannesburg. 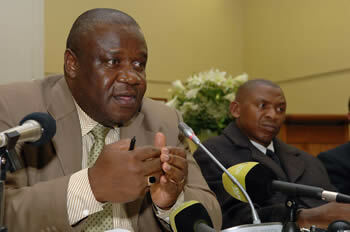 Morgan Tsvangarai giving a press briefing post the SADC Extraordinary Summit in Sandton,Jhb. Dr Augasto Salamao [Executive Chair of SADC] briefing the media on the Extraordinary Summit of SADC to take place on the 08-09 November 208 at the Sandton Convention Centre in JHB. 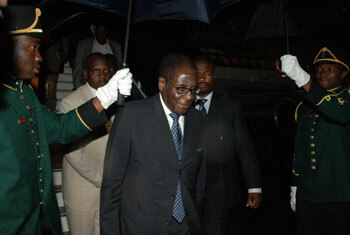 President of Zimbabwe Robert Mugabe arriving at OR Tambo International Airport for the upcomming SADC Extra-Ordinary Summit of Heads of State and Government. 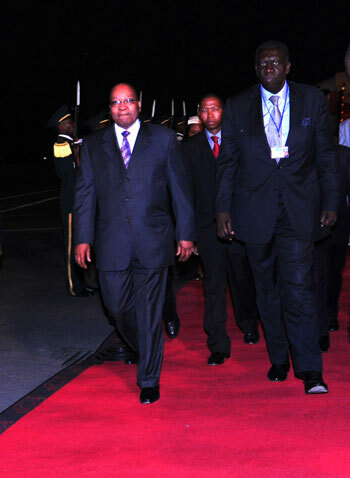 Namibian President Hifikepunye POHAMBA arrives at OR Tambo ahead of te SADC Extra-Ordinary Summit of Heads of State and Government. 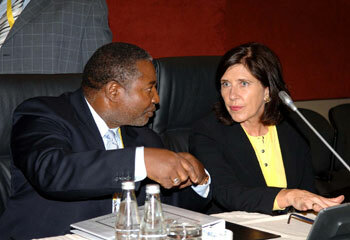 Defence Minister Nqakula and Foreign affairs deputy Minister Sue van der Merwe chating at the SADC Extraordinary Summit. Deputy Minister of Foreign Affairs, Ms Sue van der Merwe receives the Saharawi Arab Democratic Republic Minister of Foreign Affairs, Mr Mohamed Ould Salek as Special Envoy of Saharawi President Mohamed Abdelaziz, 6 November 2008. 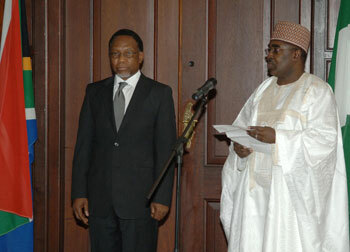 Deputy Minister Fatima Hajiag taking Oath of Affirmation from Justice Langa at the Union Buildings, Pretoria, 05 November 2008. 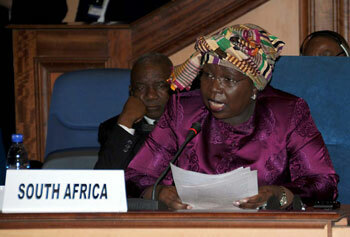 Minister of Foreign Affairs, Dr. Nkosazana Dlamini Zuma speaking during the Imbizo. 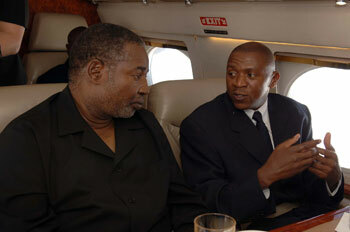 President Montlante former President Mbeki with Sibongile Khumalo. 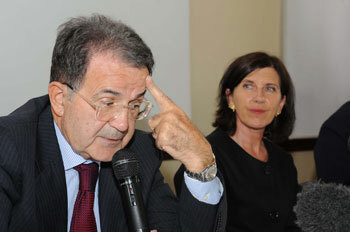 Former Italian Prime Minister Romano Prodi (front) and Deputy Minister of Foreign Affairs, Ms Sue van der Merwe (background) delivering opening remarks for the African Union – United Nations Panel of distinguished persons to hear views of SADC governments and civil society on the relationship between the United Nations and regional organisations, in particular, the African Union in conflict resolution. 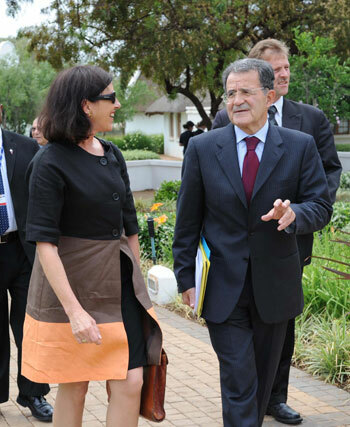 Former Italian Prime Minister Romano Prodi walking with Deputy Minister of Foreign Affairs, Ms Sue van der Merwe. 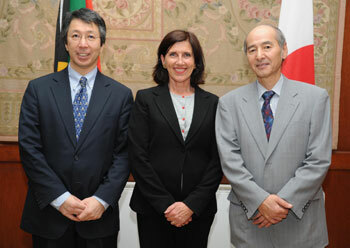 Deputy Minister of Foreign Affairs South Africa, Ms Sue van der Merwe (middle), Mr Yoshitaka Akimoto - Special Envoy to the Prime Minister of Japan (left) and Japanense Ambassador to South Africa Mr Toshinori Shigeie (right). Left to right: Acting Regional Director for Africa Mr Moustapha Soumare, Deputy Minister of Foreign Affairs SA Ms Sue van der Merwe, and Acting UN Resident Coordinator Mr George K Nsiah. 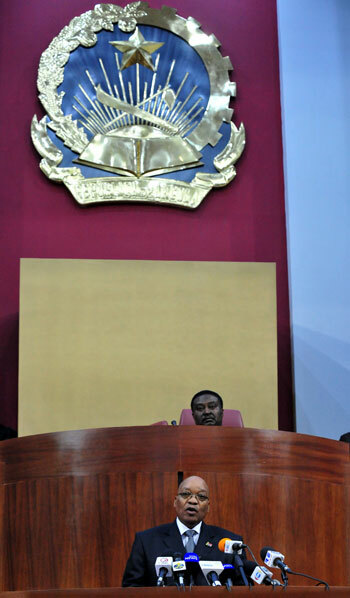 Minister of Defence Mr Charles Nqkula in Bujumbura, Burundi. 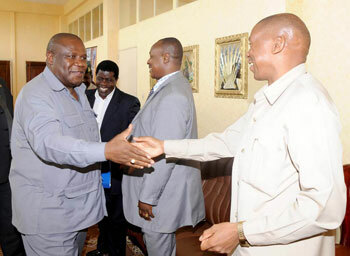 He met with President Pierre Nkurunziza of Burundi and the chair of the Palipehutu-Forces for National Liberation (FNL) Mr Agathon Rwasa. 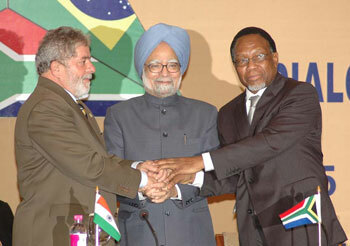 South African President Kgalema Motlanthe with his Indian and Brazilian counterparts Prime Minister Manmohan Singh and President Luis Inacio Lula Da Silva during a IBSA press conference. Dr Ayanda Ntsaluba DG of Foreign Affairs briefs the media on on the IBSA Summit and the Zimbabwe power-sharing negotiations. 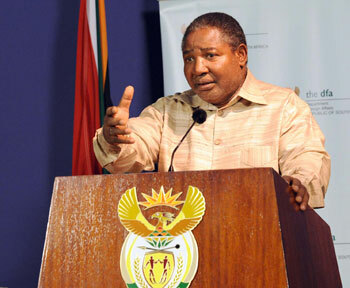 Minister Nqakula briefs the media on issues in relation to the Burundi peace process. 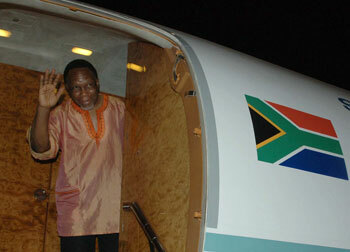 President Kgalema Motlanthe leaving South Africa to attend the IBSA Conference in India. 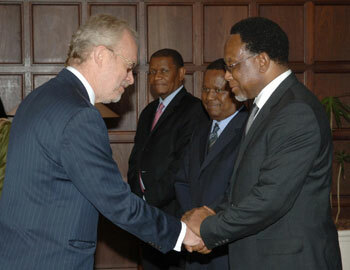 South African President Kgalema Motlanthe shaking hands with the new Sweden Ambassador to South Africa, Mr Peter Tejler during the Credential ceremony held in the Presidential Guesthouse, Pretoria, South Africa. In the background is Ref Frank Chikane (Director General in the Presidents office) and in the far back is Dr Ayanda Ntsaluba ( Director General to the Department of Foreign Affairs SA). 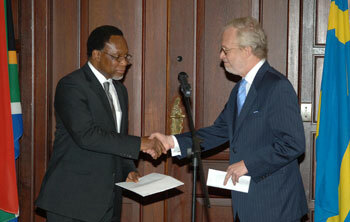 South African President Kgalema Motlanthe receiving the letter of Credence from the to the new Sweden Ambassador to South Africa, Mr Peter Tejler during the Credential ceremony held in the Presidential Guesthouse, Pretoria, South Africa. 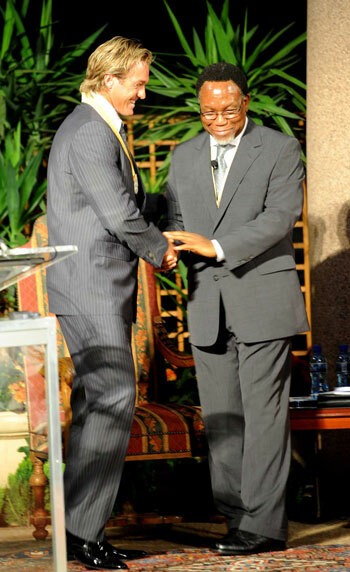 South African President Kgalema Motlanthe with Nigerian High Commissioner, Brig Gen Mohammed Buba Marwa during the Credential ceremony held in the Presidential Guesthouse, Pretoria, South Africa. 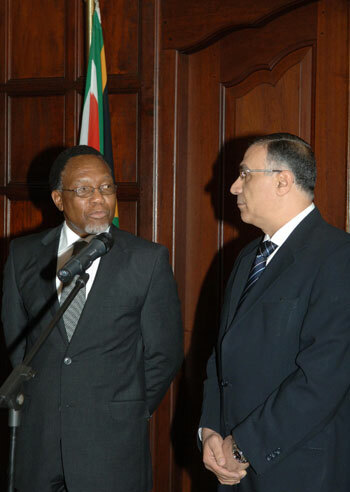 South African President Kgalema Motlanthe speaking to the new Arab Republic of Egypt Ambassador, Mr Mohamed Badr Eldin Mostafa Zayed during the Credential ceremony held in the Presidential Guesthouse, Pretoria, South Africa. 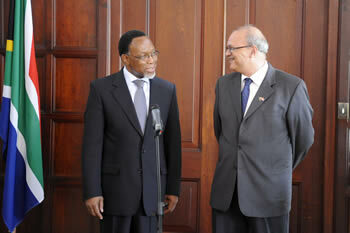 a courtesy call on President Kgalema Motlanthe at The Union Buildings in Tshwane. 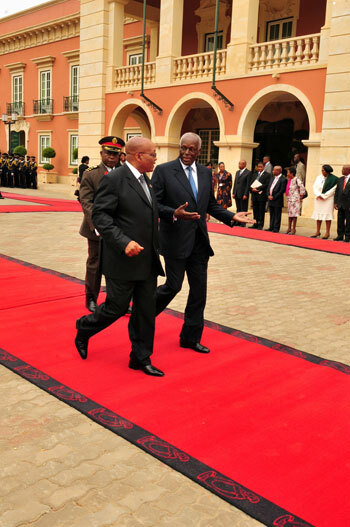 President Kgalema Mothlanthe of South Africa receive the letter of Credence from Ambassador Angel Villa Hernandez at the Presidential Guesthouse. 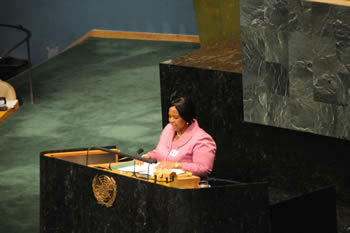 Minister Dlamini Zuma addressing the United Nations General Assembly. 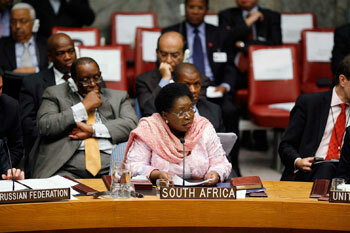 Minister Dlamini Zuma at the UN Security Council. 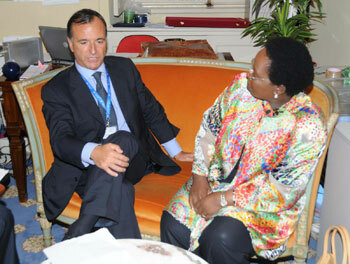 Minister Dlamini Zuma and General Secretary of the UN - Mr. Banki Moona at the United Nations General Assembly. 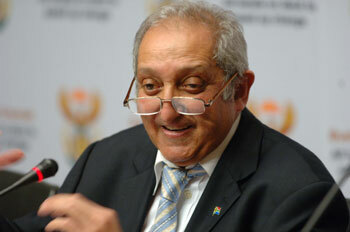 Deputy Minister Pahad brief Media on International Developments. 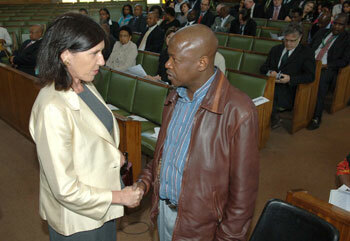 Deputy Minister of Foreign Affairs, Sue van der Merwe greeting Ernest Moyo, the brother of the late Derrick Moyo. 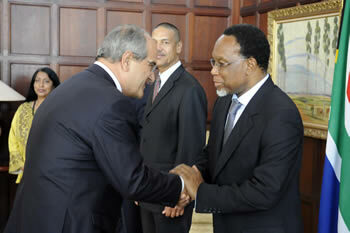 President Mbeki receives Letter of Credence from HE Mr Ladislav Straka (Ambassador-designate) to Slovak Republic. 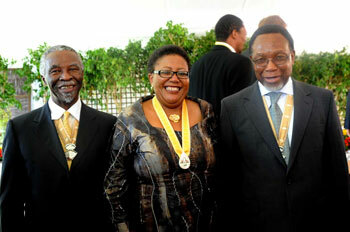 President Mbeki receives Letter of Credence from HE Ms Lineo Lydia Khechane-Ntoane (High Commissioner-designate) to Lesetho. 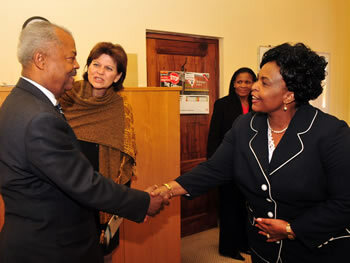 President Mbeki receives Letter of Credence from HE Ms Regine Rwamibango (Ambassador-designate) to Burundi's. 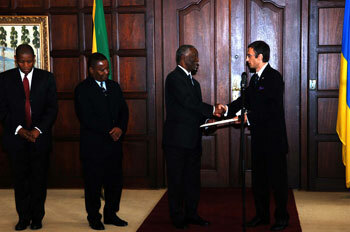 President Mbeki receives Letter of Credence from HE Mr Valiry Hrebenuik (Ambassador-designate) to Ukraine. Deputy Minister of Foreign Affairs Sue van der Merwe, Minister of State for External Affairs for the Government of India Mr Anand Sharma and Prof L Nongxa (Vice Chancellor, University of the Witwatersrand) unveiling the plaque during the Launch of Centre for Indian Studies in Africa. 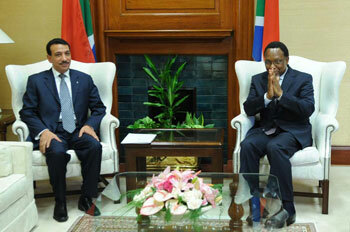 SA-Tunisia Joint Bilateral Commission in Tunisia. 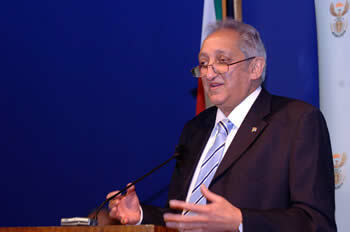 Deputy Minister Aziz Pahad briefs the Media on the situation in Zimbabwe, Union Buildings, Pretoria, 12 September 2008. 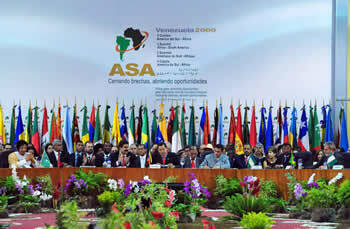 Opening of the 2nd Africa - South America Summit (ASA), Venezuela, 26-27 September 2009. 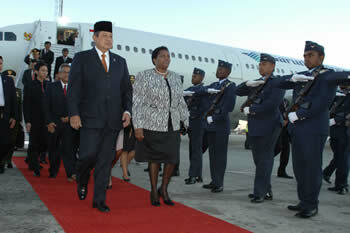 President Jacob Zuma and Minister Maiti Nkoana-Mashabane at the 2nd Africa - South America Summit (ASA), Venezuela, 26-27 September 2009. 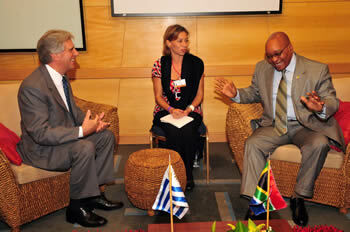 President Jacob Zuma meets President Tabare Vazquez of Uruguay at the 2nd Africa - South America Summit (ASA), Venezuela, 26-27 September 2009. 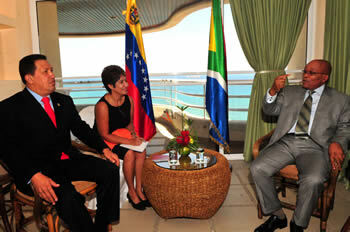 President Jacob Zuma meets President Hugo Chaves on Margarita Island during the 2nd Africa - South America Summit (ASA), Venezuela, 26-27 September 2009. 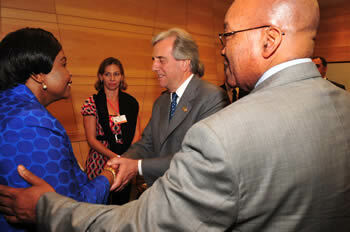 Pres Zuma meets President Verónica Michelle Bachelet Jeria of Chile at the 2nd Africa - South America Summit (ASA), Venezuela, 26-27 September 2009. 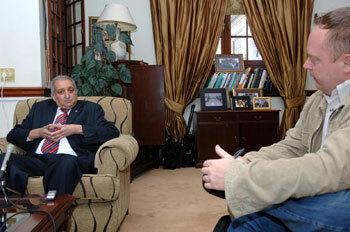 Deputy Minister of International Relations and Cooperation, Mr Ebrahim Ebrahim meeting with Iranian Foreign Minister Mohammed Bageri, 28-29 Septmber 2009. 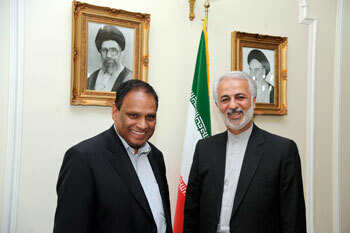 Deputy Minister Ebrahim Ebrahim meets with the Iranian Islamic Cultural and Communication Organization, Mr Mostafavi at the Islamic Cultural and Communication Organization, Tehran, Iran, 28-29 September 2009. 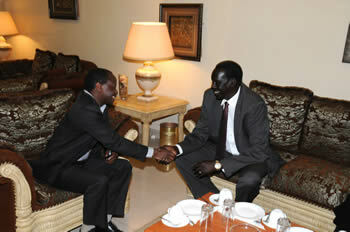 Minister in the Presidency, Mr. Collins Chabane meets with with the Foreign Minister of Sudan, Mr. Deng Alor. 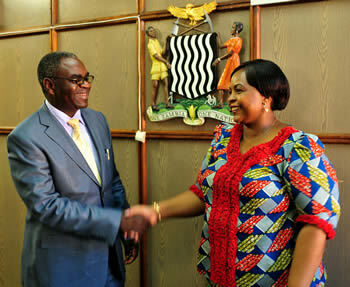 Minister Maite Nkoana-Mashabane meets with the Chairperson of the National Electoral Commission, Judge Abel Alier in Khartoum, Sudan. Minister Mashabane and Minister Chabane paid a courtesy call on President Omar El Bashir of Sudan during her working visit to Khartoum, Sudan. 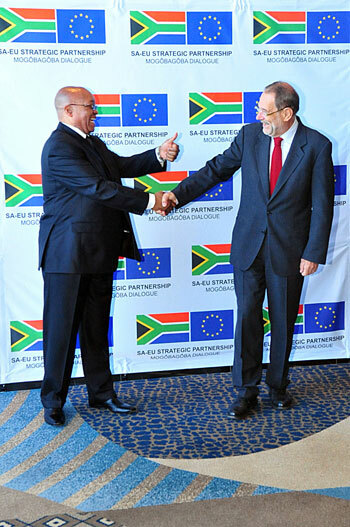 11 September 2009: President Zuma to Co–Chair the Second SA - EU Summit in Kleinmond, Cape Town. 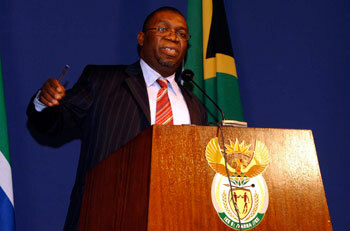 31 August 2009: Department of International Relations and Cooperation, South Africa, Media Briefing by the Director General, Dr Ayanda Ntsaluba at the Union Buildings. 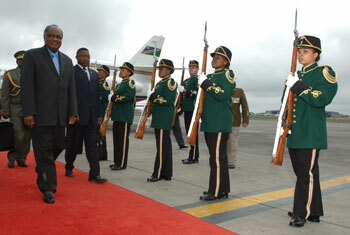 08 August 2009: President Zuma arrives in Angola for his first State Visit. 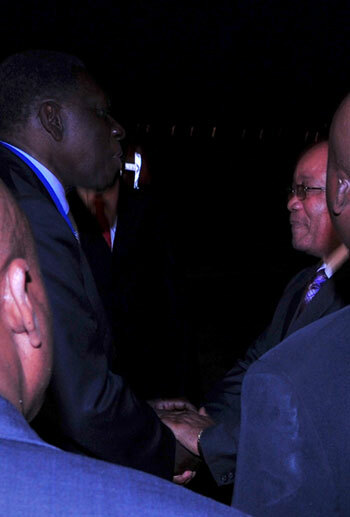 Minister Dos Anjos greets RSA president Jacob Zuma as he arrives in Luanda, Angola. 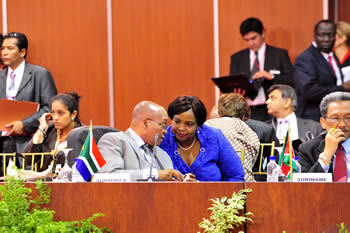 President Jacob Zuma & President Dos Santos conversate. 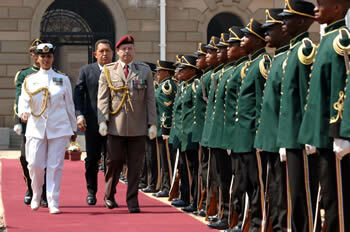 President Jacob Zuma observes the presidential guard as he is welcomed by President Dos Santos at the palace. 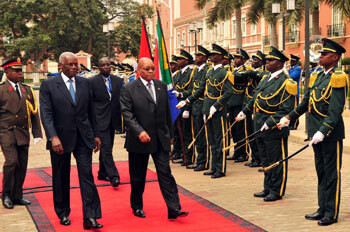 President Zuma and President Dos Santos shake hands. 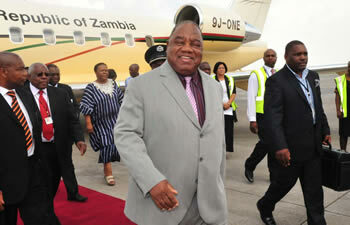 RSA President Jacob Zuma is recieved by Minister Dos Anjos upon arrival in Luanda, Angola. 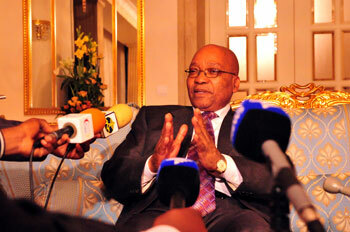 RSA President Jacob Zuma briefs the media on the Angola State Visit. 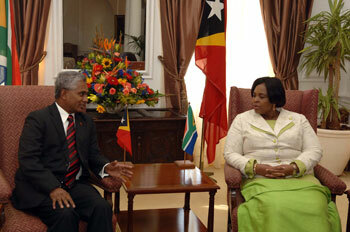 17 August 2009: Minister Nkoana-Mashabane to host Timor-Leste Foreign Affairs Minister Dr Zacarias da Costa. Minister of International Relations and Cooperation,Ms Maite Nkoana-Mashabane with Timor-Leste Foreign Affairs Minister Dr Zacarias da Costa. Left to right: Timor-Leste Foreign Affairs Minister Dr Zacarias da Costa shaking hands with Deputy Minister of International Relations and Cooperation Mr Ebrahim Ebrahim. 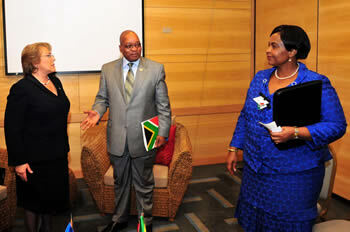 In the middle is Minister of International Relations and Cooperation Ms Maite Nkoana-Mashabane. 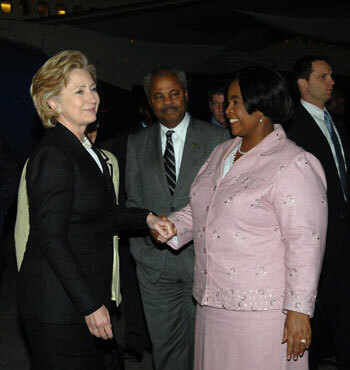 Minister of International Relations and Cooperation Ms Maite Nkoana-Mashabane receives the United State of America Secretary of State Ms Hillary Clinton at OR Tambo International Airport, 6 August 2009. 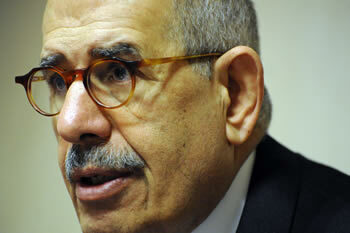 The Directore-General, Dr Mohamed El Baradei of the IAEA speaks during a press conference concluding his visit to South Africa. 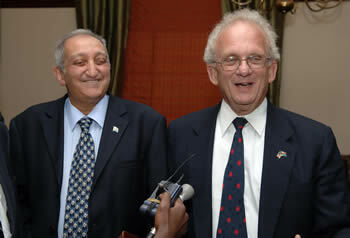 With him is Ambassador Abdul Minty from the Department of International Relations and Cooperation, 21 July 2009. 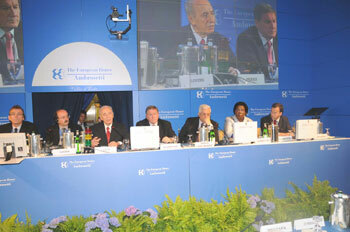 08-10 July 2009: G8 Summit in L’Aquila, Abruzzo in Italy. 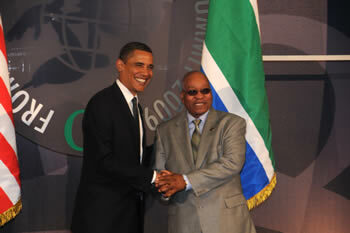 President Zuma held bilateral discussions with President Barack Obama of the US in Italy during the G8 Summit. Minister Maite Mashabane , Minister of International Relations and Cooperation of South Africa ,meet with President Obama during the G8 ummit. 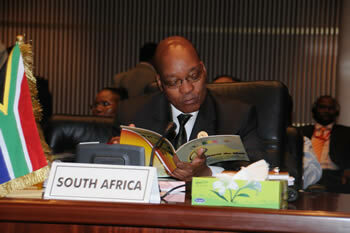 President Zuma attends the G8 plus G5 Summit in Italy. 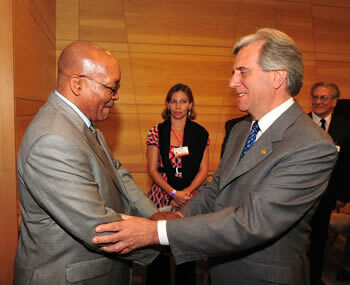 President Zuma with Prime Gordon Brown of the UK during the G8 Summit in Italy. 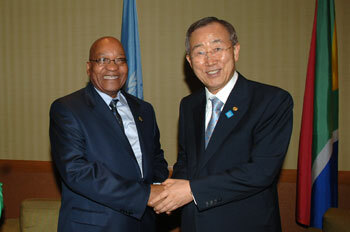 President Zuma held bilaterals discussions with the General Secretary of the UN . 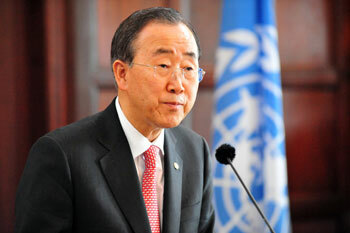 Mr. Bani KI Moon during the G 8 Summit in Italy. 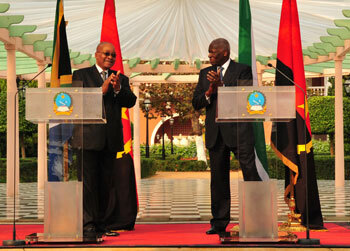 President of South Africac, Jacob Zuma presents his speech during the General Debate at the NAM Summit in Sharm El Shiekh, Egypt, 15 July 2009. 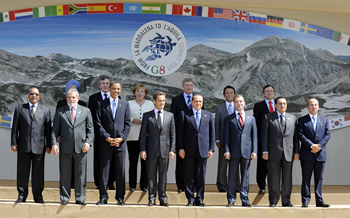 Members of the G8 in L'Aquila, Italy, 8-10 July 2009. 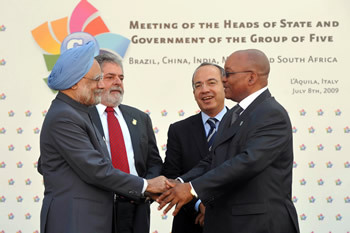 Members of the G5 - Mexico, Brazil, India, South African and China - meet before the G8 Summit in L'Aquila, Italy, 8 July 2009. 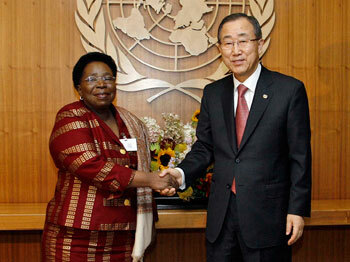 Minister Mashabane meets with the UN Secretary General , Mr. Bani KI Moon at the UN in New York. 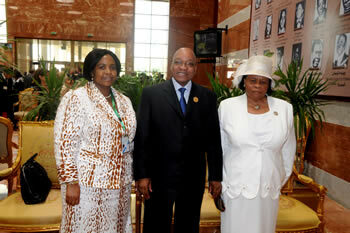 President Zuma with the first lady ,and Minister Maite Mashabane , Minister of International Relations and Cooperation at the opening ceremony of the AU Heads of State Summit in Sirte , Libya. 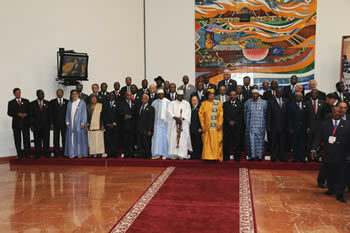 Family photo of the Heads of State at the opening ceremony of the AU Summit in Sirte , Libya. 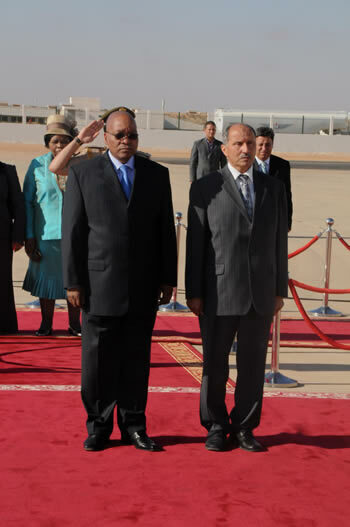 President Jacob Zuma arrives for the AU Summit in Sirte, Libya. 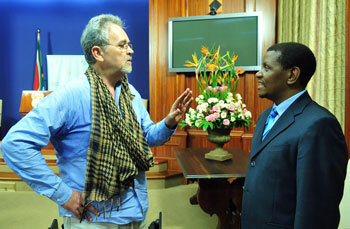 The Minister of Arts and Culture of Libya welcomes President Zuma, 29 June 2009. 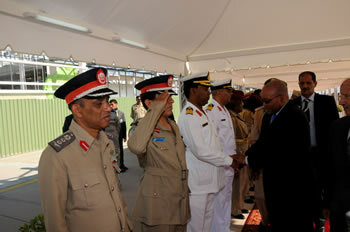 President Zuma meets with the local dignitries on his arrival in Sirte, Libya, 29 June 2009. 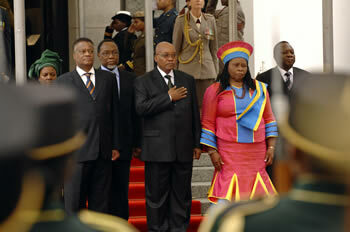 President Zuma observes the military and takes the salute Sirte, Libya, 29 June 2009. 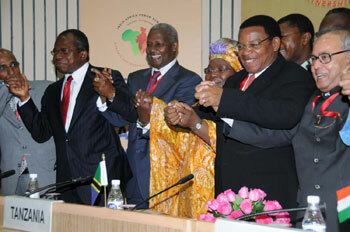 Minister Maite Nkoana-Mashabane, Minister of International Relations and Cooperation, attends the Ministerial Opening Ceremony of the AU Summit in Sirte, Libya, 28 June 2009. 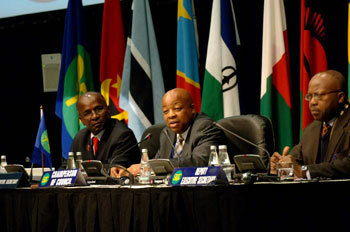 20 June 2009: SADC Extra-ordinary Summit in Sandton, Johannesburg. 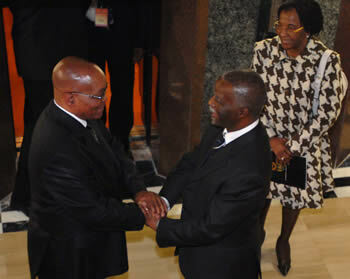 President Jacob Zuma and President Robert Mugabe embrace as they met at SADC, Sandton Convention Center, 20 Jnue 2009. 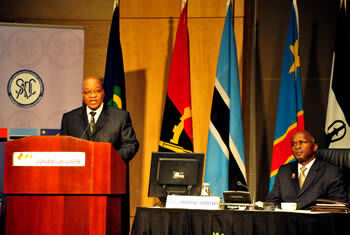 President Jacob Zuma consults with SADC Exexutive Sec Dr Augasto Salomao at the Summit. 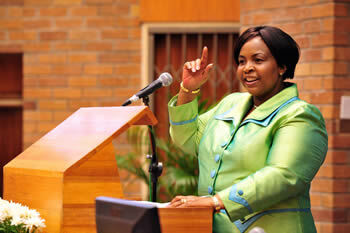 SADC's Executive Secretary, Dr Tomza Salomoa during the Press Conference, Sandton Convention Center, 19 June 2009. 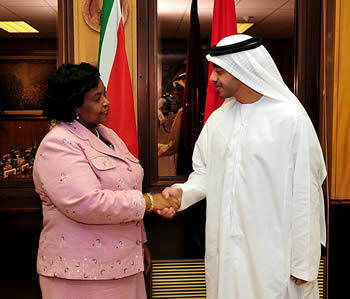 Minister Maite Nkoana-Mashabane greets the Foreign Minister Shaik Abdullah bin Zayed Al-Nahyan of the UAE, 4 June 2009. 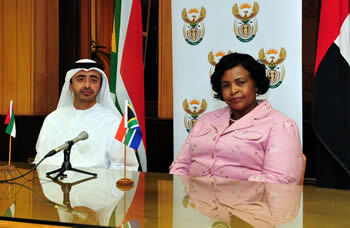 Minister Maite Nkoana-Mashabane and the Foreign Minister Shaik Abdullah bin Zayed Al-Nahyan of the UAE respond to the media questions, 4 June 2009. 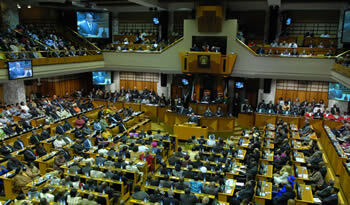 State of the Nation Address by the President of the Republic of South Africa, Jacob G Zuma, to the Joint Sitting of Parliament, Cape Town, South Africa, 3 June 2009. 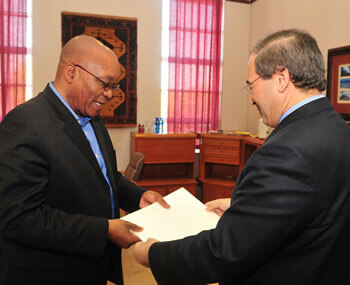 Deputy Foreign Minister of Syrian with President Jacob Zuma to deliver a special message to the president, Esselen Park, Kempton Park, 29 May 2009. 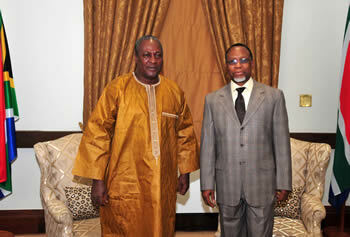 Ghana Vice President John Dramani Mahama meets with Deputy President Kgalema Motlanthe at Union Buildings, 19 May 2009. 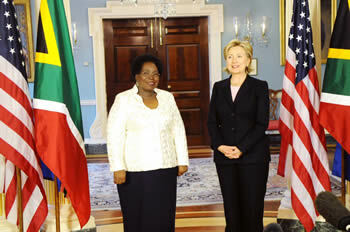 Minister of Foreign Affairs, Dr Nkosazana Dlamini Zuma and US Secretary of State, Ms Hillary Clinton, at the US Department of the State, Washington, USA, 19 March 2009. 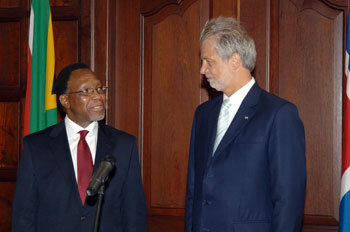 17 March 2009: President Kgalema Motlanthe to receive credentials from designated Heads of Mission. 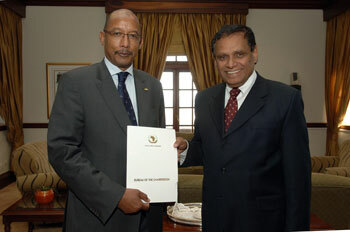 Singapore High Commissioner HE Mr. Benard during the presentation of letters of credence or commission to President Kgalema Motlanthe, Pretoria. 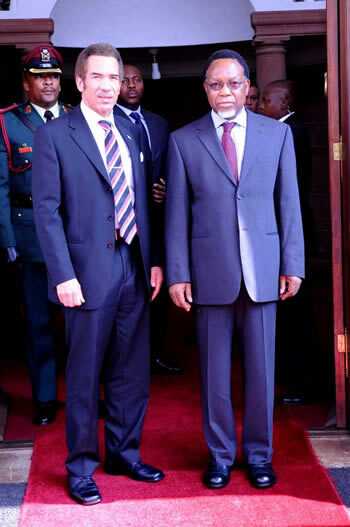 Portugal Ambassador HE Mr. Joao Nugent Ramos-Pinto during the presentation of letters of credence or commission to President Kgalema Motlanthe, Pretoria. 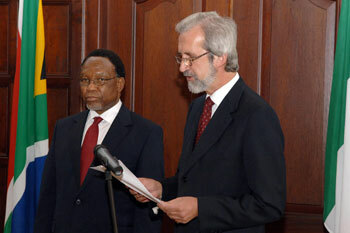 Peru Ambassador HE Mr. Daul Matute-Mejia during the presentation of letters of credence or commission to President Kgalema Motlanthe, Pretoria. 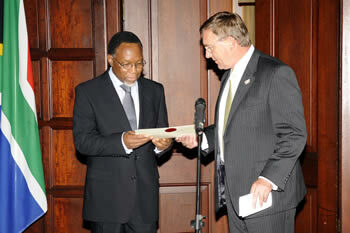 New Zealand High Commissioner HE Mr. Geoffrey John Randal handing over his letter of credence or commission to President Kgalema Motlanthe, Pretoria. 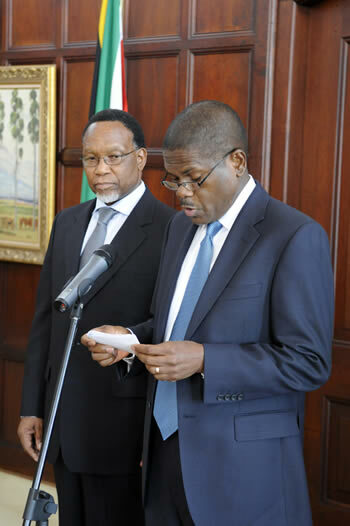 Jamaican High Commissioner HE Mr. Audly Rodrigues addressing media during the presentation of letters of credence or commission to President Kgalema Motlanthe, Pretoria. 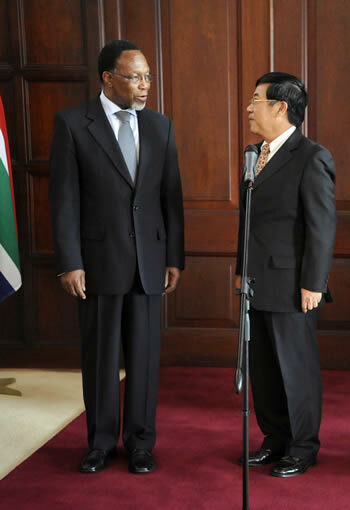 Socialist Republic of Vietnam HE Mr Nguyen Manh Hung (Ambassador-designate) during the presentation of letters of credence or commission to President Kgalema Motlanthe, Pretoria. 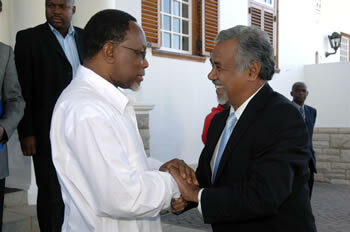 02 March 2009: President Motlanthe to host the Socialist International Commission for a Sustainable World Society, Kleinmond. 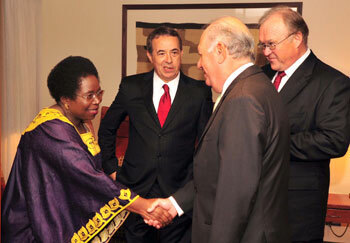 RSA Foreign Minister Nkosazana Dlamini-Zuma greets Ricardo Lagos as Luis Ayala [Sec Gen of Socialist International Commission] and Goran Persson look on. 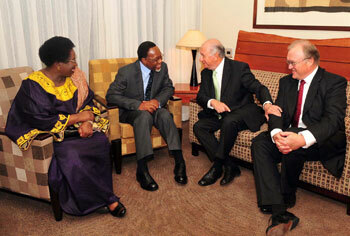 RSA Foreign Minister RSA President Kgalema Motlanthe Rcardo Lagos and Goran Persson share a joke. 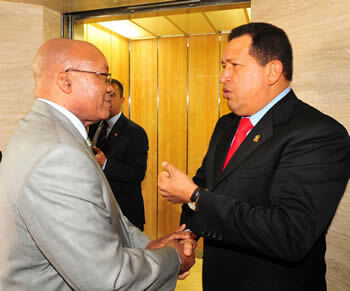 ANC President Jacob Zuma greeting Luis Ayal at the start of the climate change meeting in Kleinmond, Western Cape. 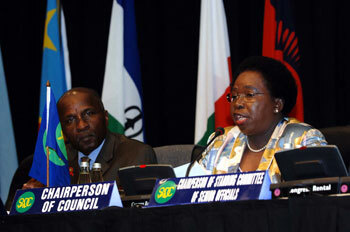 26 – 27 February 2009: Welcome Address by Minister Dr. Nkosazana Dlamini Zuma to the SADC Council of Ministers Meeting, Cape Town. 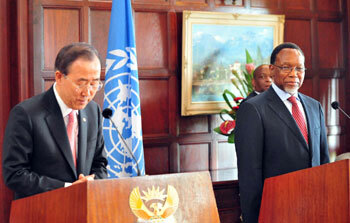 President Motlanthe smiles as UNSG Ban Ki-Moon address a media briefing. UNSG Ban Ki-Moon breifing media. 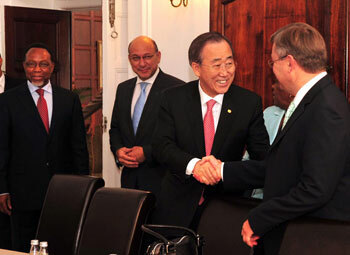 UNSG Ban Ki-Moon greets Minister Van Schalkwyk as President Motlanthe and Minister Manuel look on. 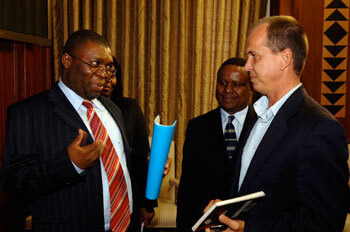 20 February 2009: Transcript Copy: Notes Following Briefing to Media by Foreign Affairs Director General Ayanda Ntsaluba. 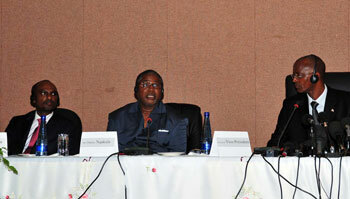 Dr Ayanda Ntsaluba interacting with members of the media Yousefi and Peter during a press briefing at the Union Buildings. 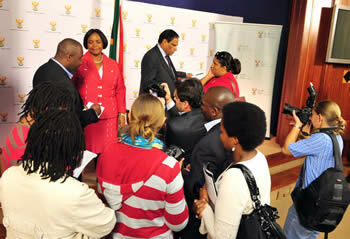 Dr Ayanda Ntsaluba DG Foreign Affairs interacting with JJ from radio702 after a press briefing at the Union Buildings. 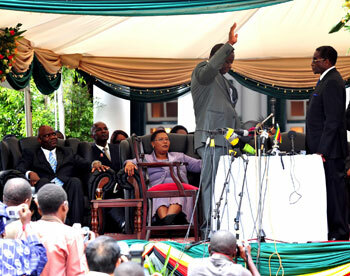 13 February 2009: Address Delivered by The President of South Africa, Kgalema Motlanthe, on the Occasion of the Swearing-In of Cabinet Ministers in Harare, Zimbabwe. 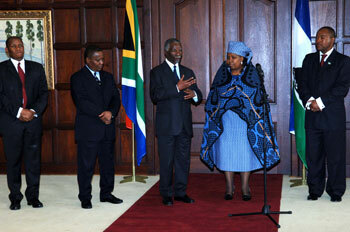 Minister Dlamini Zuma greeting prime minister designate Morgan Tsvangarai. 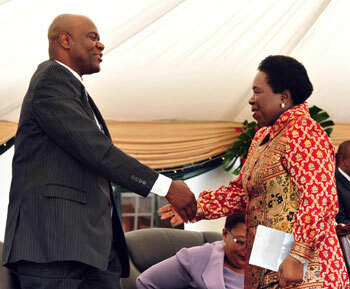 Minister Dlamini Zuma greeting deputy prime minister designate Prof Muthambara. 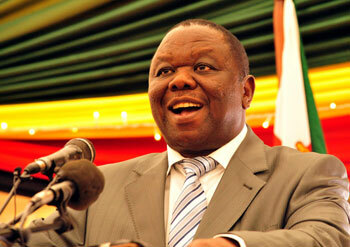 A happy Prime Minister HE Morgan Tsvangarai at the sworing in ceremony. 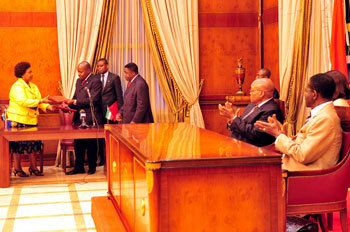 President R Mogabe administering an oath of office to Prime Minister designate M Tsvangarai. 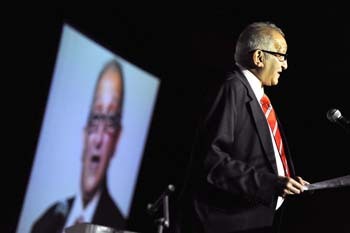 President Mogabe gestures as he delivers a key note address at the sworing in ceremony. 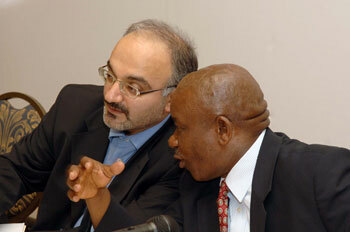 04 February 2009: Notes following a Briefing by Deputy Minister Sue van der Merwe and her Qatari Counter-Part, Mr Mohammed Al-Rumaihi, Cape Town. 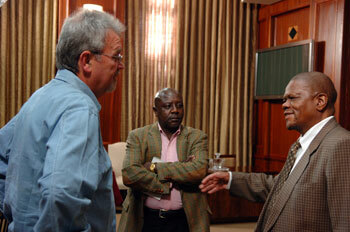 28 January 2009: Rev Frank Chikane briefing the Diplomatic Corps in South Africa with the SADC Zimbabwe process. 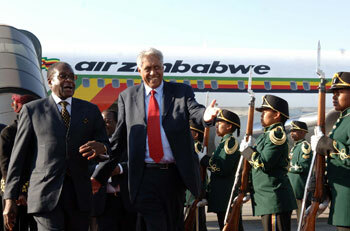 President Rupian Banda of Zambia displays a smile as he arrives at OR Tambo International Airport ahead of the SADC Summit, 25 January 2009. 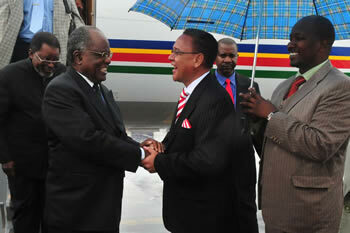 President Hifikepunye Pohamba of Namibia is welcomed by Public Works Minister Doige as he arrives at OR Tambo International Airport ahead of the SADC Summit, 25 January 2009. 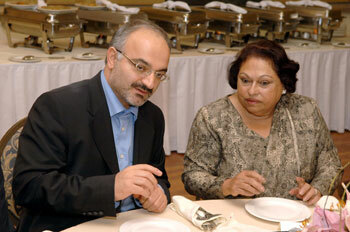 16 January 2009: Media Programme for incoming Visit by Chinese Foreign Minister. 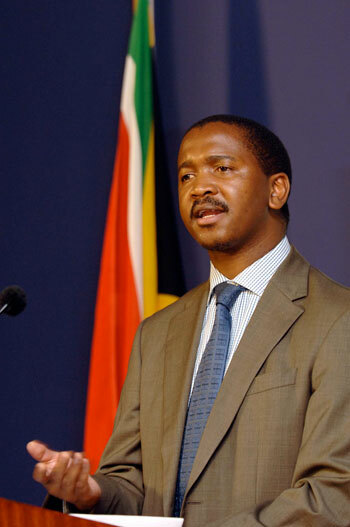 14 January 2009: Notes following Briefing to Media by Director-General Dr Ayanda Ntsaluba Media Centre, Union Buildings, Pretoria. 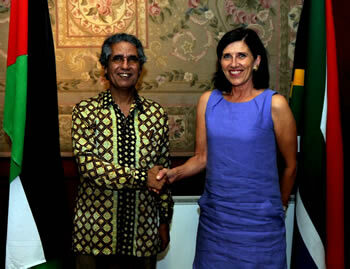 13 January 2009: Farewell Remarks by Deputy Minister Sue van der Merwe on the occasion of the farewell lunch in honour of Ambassador Eric Bost of the United States of America. 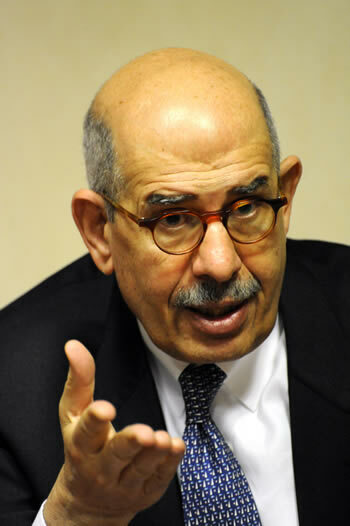 04 – 05 December 2008: Foreign Affairs to co-host a Conference on Multilateralism and International Law with Western Sahara as a case study. 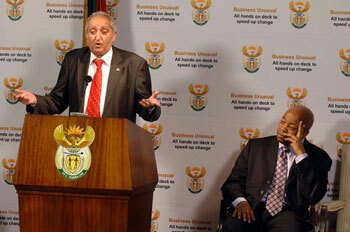 Farewell function of former Deputy Minister Aziz Pahad. 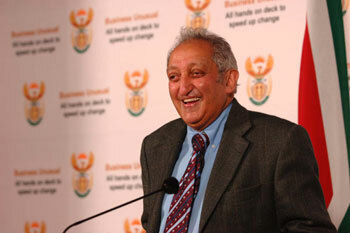 Former Deputy Minister of Foreign Affairs Mr Aziz Pahad farewell function held at Galagher Estate, Midrand. 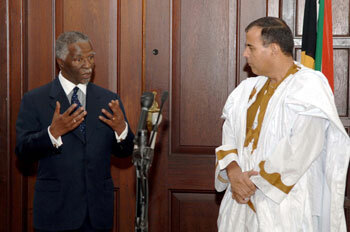 27 Nov 2008: President Montlante recieved HE Amb MM Al-Ali of Saudi Arabia. 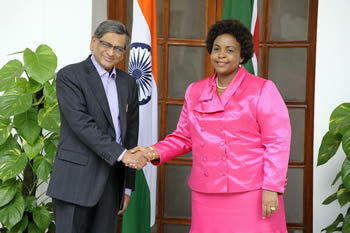 The Ambassador payed a courtesy call on the president at his offices in the Union Building this afternoon. 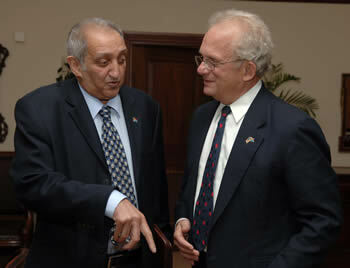 President Montlante greeting Amb Al-Ali. 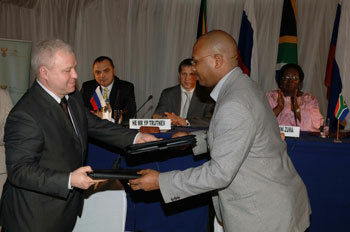 25 November 2008: Minister Dlamini Zuma to Co-Chair the South Africa – Russia (ITEC) Intersessional Meeting, Durban. South African Foreign Minister, Dr Nkosazana Dlamini Zuma and the Russian Federation Minister of Natural Resources and Ecology, Mr Yuri Trutnev during the press conference. 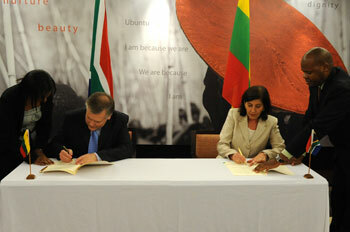 Deputy Minister van der Merwe met with her Lithuanian counterpart Deputy Minister Jusys. Deputy Minister Sue van der Merwe with Lithuanian Deputy Minester Jusys sharing a light moment before the signing as protocol officers look on. 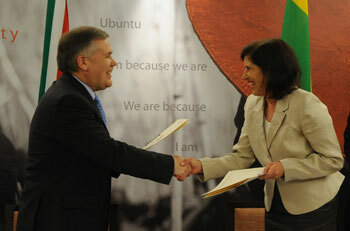 Deputy Minister Sue van der Merwe and Lithuanian counterpart HE Jusys shake hands as they exchange MoU. 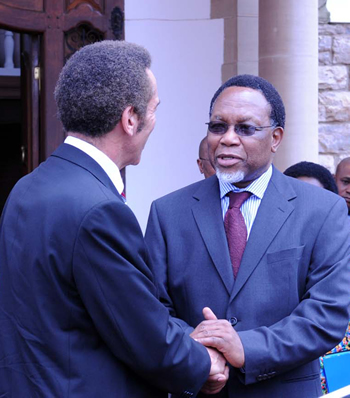 President Kgalema Montlante welcomes President Seretse Khama Ian Khama of Botswana at the Presidential Guesthouse, Pretoria, South Africa, 23 November 2008. 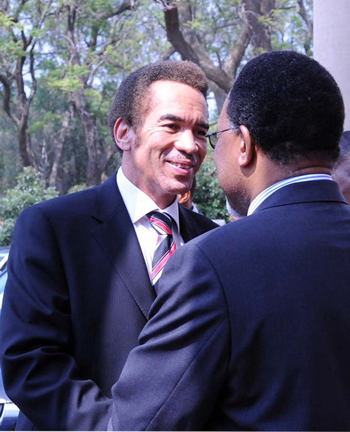 President Kgalema Montlante and President Seretse Khama Ian Khama of Botswana discuss issues of common interest including those that are being dealt with within SADC, Presidential Guesthouse, Pretoria, South Africa, 23 November 2008. 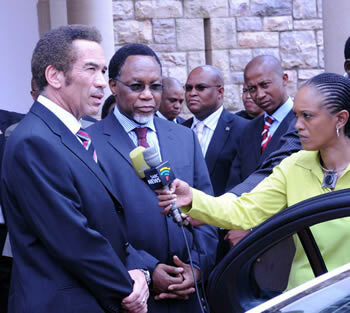 President Seretse Khama Ian Khama is interviewed by Ms Strydom of SABC, Presidential Guesthouse, Pretoria, South Africa, 23 November 2008. 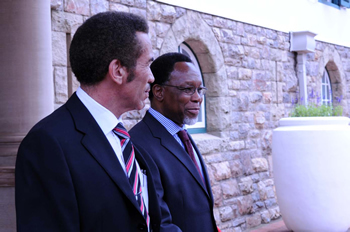 President Kgalema Montlante bids President Seretse Khama Ian Khama of Botswana farewell at the Presidential Guesthouse, Pretoria, South Africa, 23 November 2008. 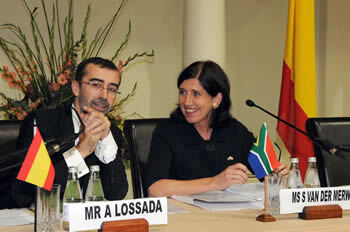 Deputy Foreign Minister Sue Van Der Merwe and Mr Angel Lossada, the Secretary of State for Foreign Affairs of the Kingdom of Spain during the Fifth Annaul SA-Spanish Consultations, 21 November 2008, Pretoria, South Africa. 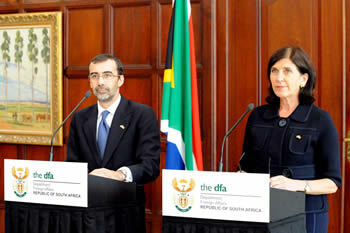 Deputy Foreign Minister Sue Van Der Merwe and Mr Angel Lossada, the Secretary of State for Foreign Affairs of the Kingdom of Spain, 21 November 2008, Pretoria, South Africa. 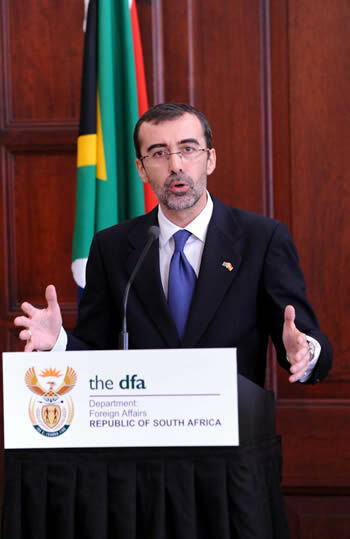 The Secretary of State for Foreign Affairs of the Kingdon of Spain during the Fifth Annaul SA-Spanish Consultations, 21 November 2008, Pretoria, South Africa. Mr Xolisa Mabhongo, Deputy Head of UN-Multilateral briefs the media on South Africa's interaction with issues in the United Nations including the current issue in the DRC and the hi-jackings in the Gulf of Aden, off the coast of Somalia. 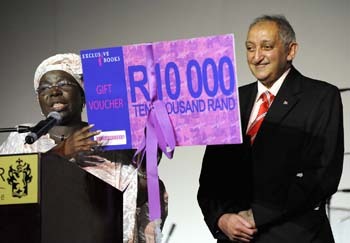 Minister of Arts and Culture Pallo Jordan and Minister of Foreign Affairs Dr. Nkosazana Dlamini Zuma during the memorial service for Miriam Makeba, 15 November 2008. 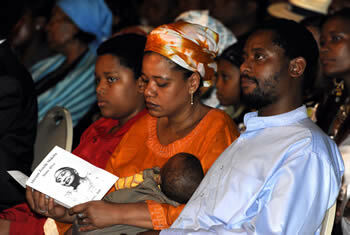 Family members of Miriam Makeba attend the memorial service. 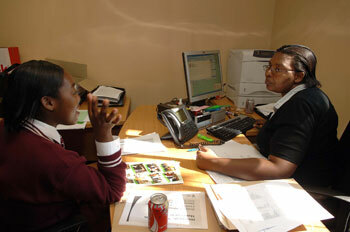 Left to right: Miriam Makeba's great grandchild Lindelane (13), his mother and grand daughter of Makeba Zenzi and her husband, 15 November 2008. 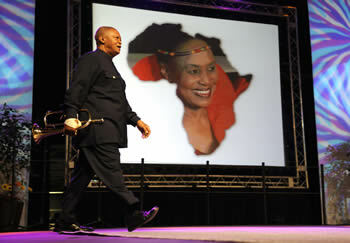 Artist Hugh Masekela walks onto the stage to perform one of Miriam Makeba's famous songs. , 15 November 2008. Deputy Minister Sue van der Merwe meets H E Morteza Sarmadi, Executive Director of the Indian Ocean Rim Assossiation for Regional Co-operation, Union Buildings. 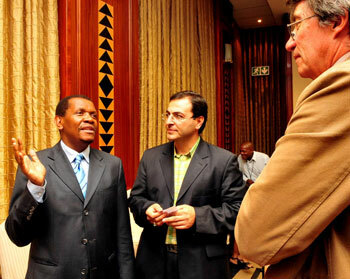 Pretoria, South Africa, 12 November 2008. 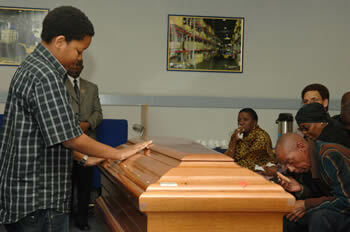 Miriam Makeba's great grandchild Lindelane (13) says goodbye. 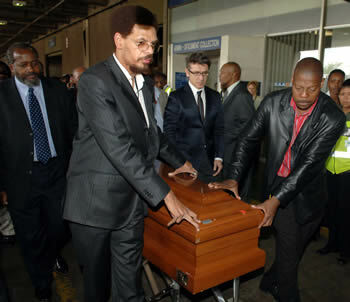 Minister of Arts and Culture Pallo Jordan (far left) and Miriam Makeba's family members carry the coffin to the funeral car. 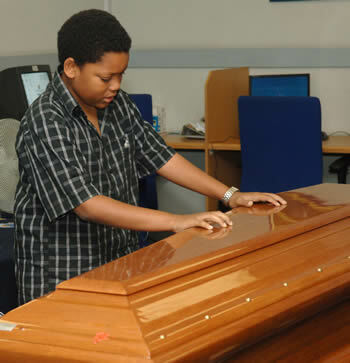 Miriam Makeba's great grandchild Lindelane (13), grand daughter Zenzi, personal assistant Lumumba and an Italian official, watch on as the coffin is placed in the funeral car. 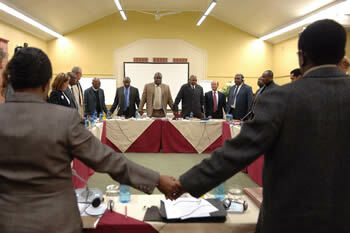 8 November 2008: SADC Ministerial Organ Troika Meeting, Saturday. 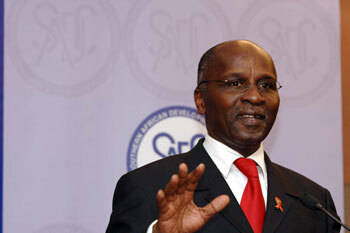 Zimbabwe's Prime Minister designate, Mr Morgan Tsvangarai giving a press briefing post the SADC Extraordinary Summit in Sandton,Jhb. Deputy Minister of Foreign Affairs, Ms Sue van der Merwe and the Saharawi Arab Democratic Republic Minister of Foreign Affairs, Mr Mohamed Ould Salek. 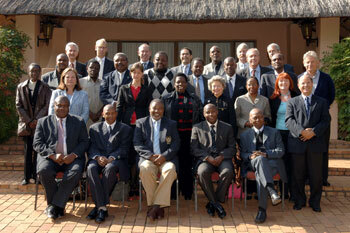 International Developments, Pretoria, South Africa. 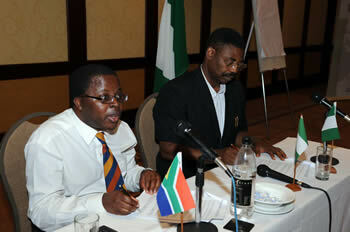 Acting Chief Director Mr Johnny Pitswane and Ambassador Chike Anigbo of Nigeria, Pretoria, South Africa. 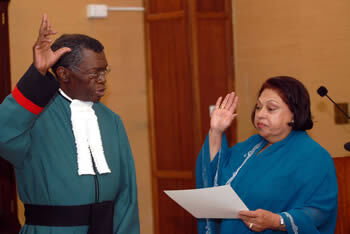 Deputy Minister Fatima Hajiag taking oath of Justice Langa. 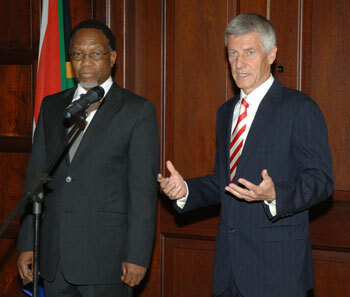 Foreign Affairs Director-General Dr Ayanda Ntsaluba and Deputy Director-General Mxolisi Nkosi address the media, 30 October 2008. 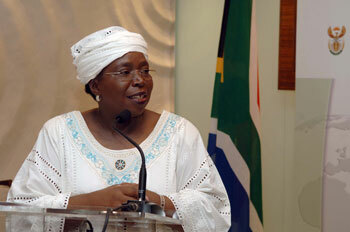 28 Oct 2008: Minister Dlamini Zuma to host a Government Imbizo, Bulwer, Midlands, Kwazulu-Natal. 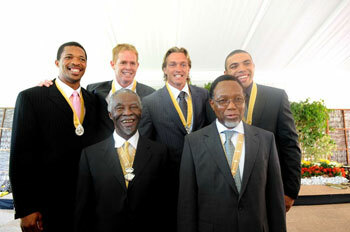 President Montlante former President Mbeki with Makhaya Ntini Shaun Pollock Percy Montgomery and Brian Habana. 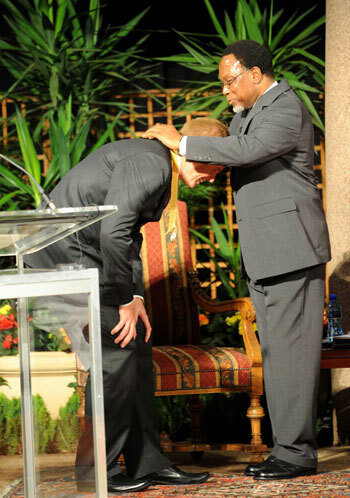 Shaun Pollock bowes as President Montlante bestows an Order on him. 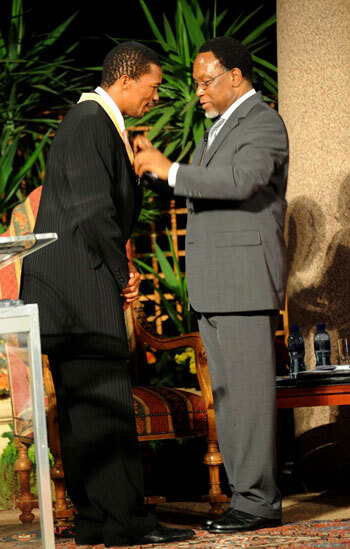 President Montlante bestows an Order on Makhaya Ntini. 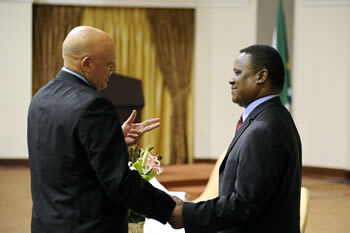 President Montlante Shaking hands with Lewis Nkosi who was awarded the order of Ikhamanga in silver. 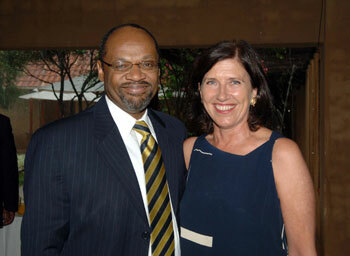 President Montlante greets Percy Montgomery. 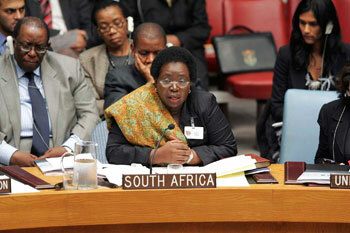 27 October 2008: Opening Remarks by Deputy Minister Sue Van der Merwe at the Roundtable Discussion With Members of the AU/UN Panel, Pretoria. 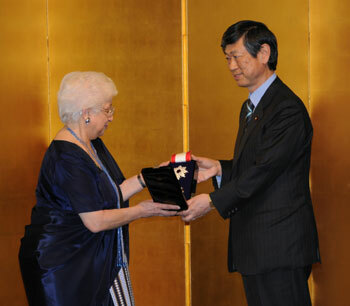 Deputy Minister of Foreign Affairs South Africa, Ms Sue van der Merwe greeting Mr Yoshitaka Akimoto - Special Envoy to the Prime Minister of Japan. In the middle is Japanense Ambassador to South Africa Mr Toshinori Shigeie. 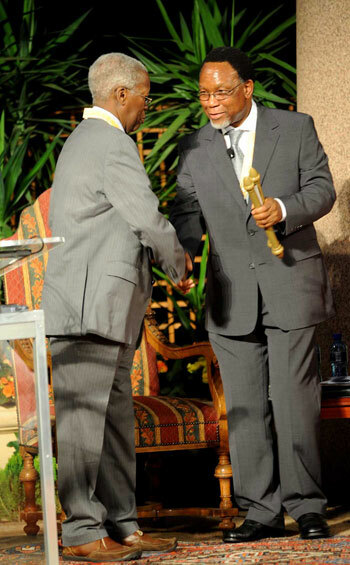 22 October 2008: Statement by the Honourable Kgalema Motlanthe, President of South Africa and Chairperson of The Southern African Development Community (SADC) At the COMESA-EAC-SADC Tripartite Summit, Kampala, Uganda. 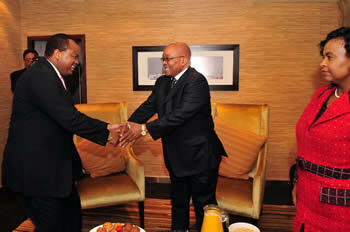 President of South Africa Kagalema Motlanthe with Rwandan President Paul Kagame. 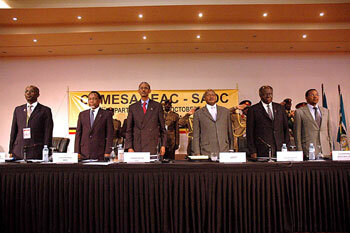 Left to right: Southern African Development Community (SADC) Executive Secretary Mr Tomaz Augusto Salomao, South African President Kgalema Motlanthe, Rwandan President Paul Kagame, President Yoweri Museveni of Uganda, Kenyan President Mwai Kibaki ,The President of the United Republic of Tanzania, currently Chair of the African Union. 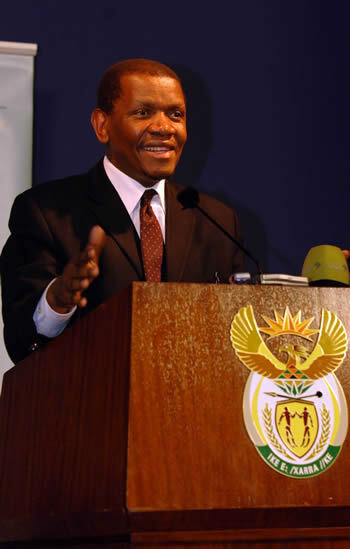 15 October 2008: Address by the President of South Africa, Kgalema Motlanthe, at the 3rd IBSA Summit Dialogue Forum, New Delhi, India on Connectivity through Transport.Wednesday. 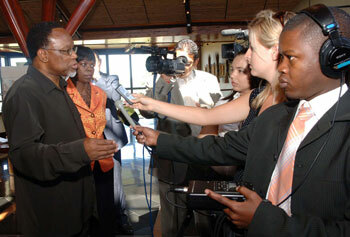 14 October 2008: Notes following Briefing to Media by Director-General Dr Ayanda Ntsaluba, Media Centre, Union Buildings, Pretoria. 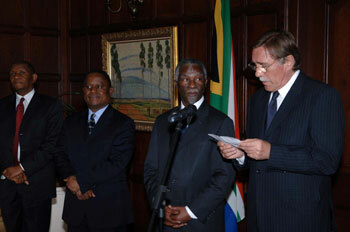 10 October 2008: Remarks by President Motlanthe to designates Heads of Mission at Credentials Ceremony, Presidential Guesthouse, Pretoria. 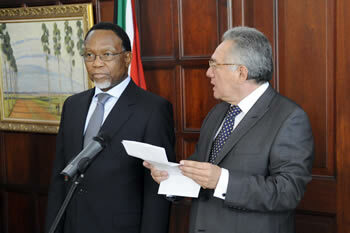 President Kgalema Mothlanthe of South Africa receive the letter of Credence from Ambassador Elio Menzione of Italy at the Presidential Guesthouse. 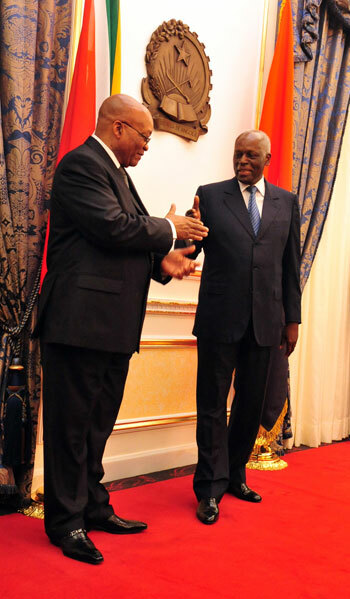 President Kgalema Mothlanthe of South Africa receive the letter of Credence from Ambassador Gudmundur Eiriksson of Iceland at the Presidential Guesthouse. 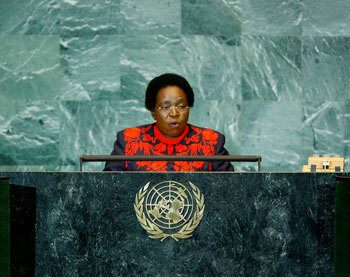 29 September 2008: Minister Dlamini Zuma addressing the United Nations General Assembly, New York. 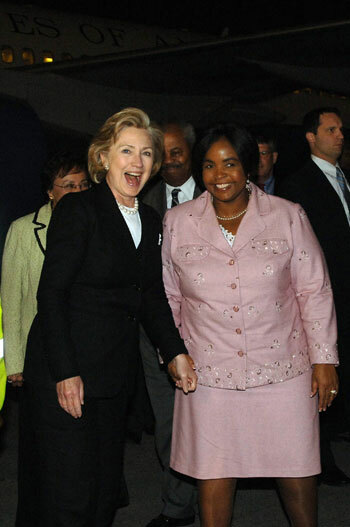 18 Sept 2008: Memorial Service for the late South Africa’s Deputy Ambassador to Washington, Derrick Moyo. 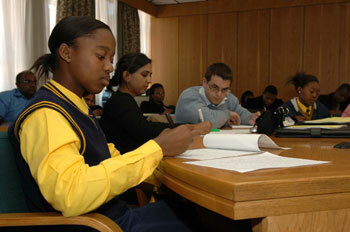 16 September 2008: Address by Deputy Minister of Foreign Affairs, Ms Sue van der Merwe, on the occasion of the launch of the Centre for Indian Studies in Africa at the University of the Witwatersrand. 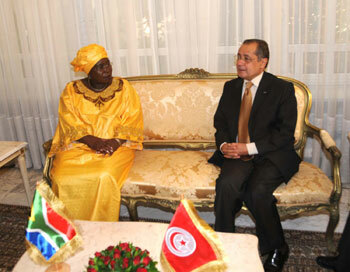 8 – 9 September 2008: Minister Dlamini Zuma to lead South African delegation to the South Africa - Tunisia Joint Bilateral Commission (JBC) in Tunis, Tunisia. 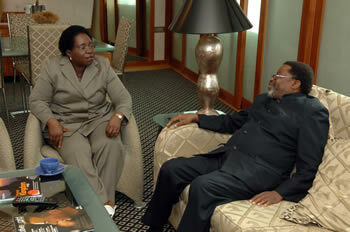 during which she conveyed a message from President Thabo Mbeki. Tunisia Bilateral Commission in Tunisia. 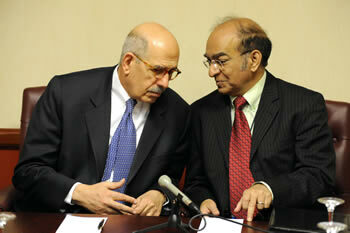 Delagation at the start of the Joint Bilateral Commission in Tunisia. 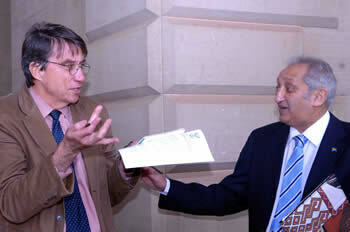 Deputy Minister Aziz Pahad interacts with Peter Fabricious from the Independent News post the Media Briefing on Zimbabwe, Union Buildings, Pretoria, 12 September 2008. 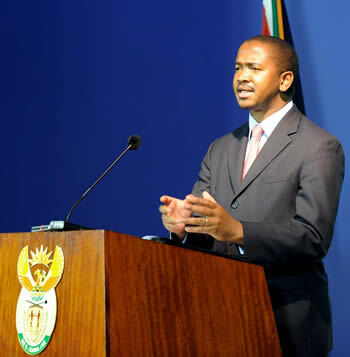 Director-General for Foreign Affairs, Dr Ayanda Ntsaluba briefs the Media on the IAEA, Union Buildings, Pretoria, 12 September 2008. 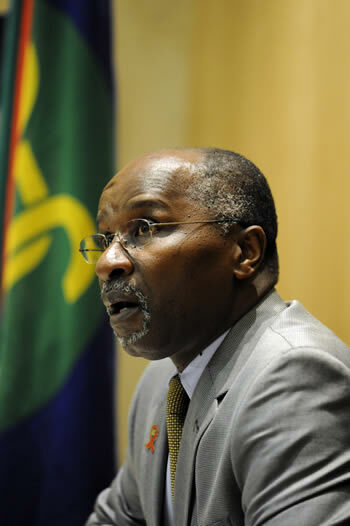 Ambassador Abdul Minty briefs the Media on the IAEA and his candidature for the post of Director-General for the AIEA, Union Buildings, Pretoria, 12 September 2008. 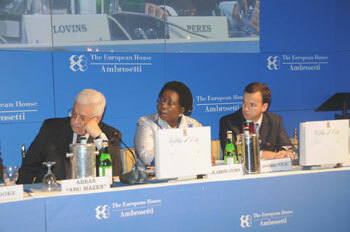 Members of a Panel at the Debate on the World Outlook - A Mediterranean Perspective at the Ambrosetti Forum in Italy. Dr. Nkosazana Zuma together with President Mahmoud Abbas of Palestine at the Ambrosetti Forum at Lake Como in Milan , Italy. 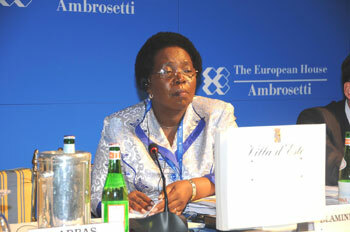 Minister Nkosazana Zuma at the Ambrosetti Forum at Lake Como , MIlan , Italy. 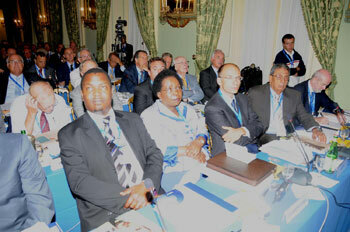 Dr. Nkosazana Zuma attending the Ambrosetti Forum in Milan , Italy. 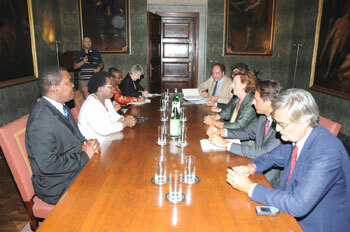 Minister Nkosazana Zuma held bilateral discussions with the Mayor of Milan in Milan , Italy before attending the annual Ambrosetti Forum . 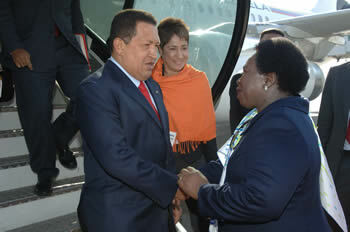 Minister of Foreign Affairs Dr Nkosazana Dlamini Zuma meets Venezuelan President Hugo Chavez at the OR Tambo International Airport, 2 September 2008. 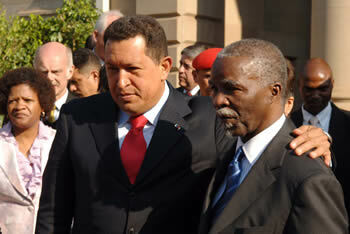 South African President Thabo Mbeki with Venezuelan President Hugo Chavez at the Union Buildings, Pretoria, South Africa, 2 September 2008. 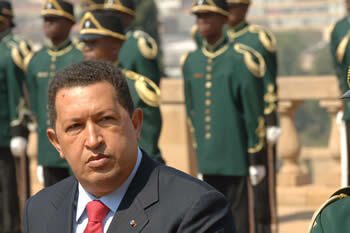 Venezuelan President Hugo Chavez at the Union Buildings, Pretoria, South Africa, 2 September 2008. 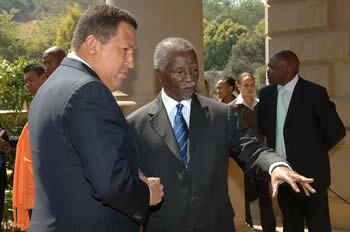 South African President Thabo Mbeki with Venezuelan President Hugo Chavez, 2 September 2008. 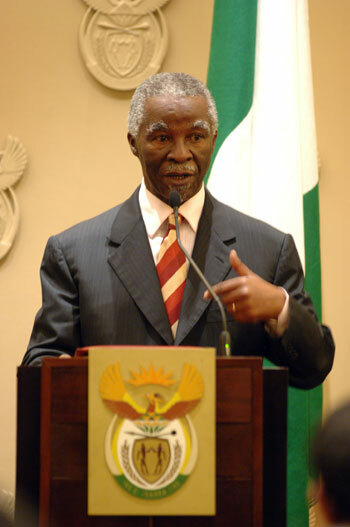 South African President Thabo Mbeki at the Press Briefing, 2 September 2008. 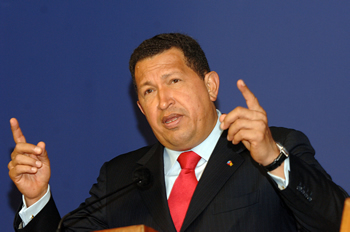 Venezuelan President Hugo Chavez at the Press Briefing, 2 September 2008. 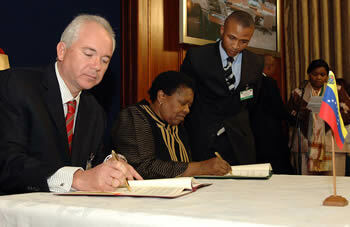 Minister Ramirez and Petrosa CEO, Mr Mkize exchange agreements on oil, 2 September 2008. 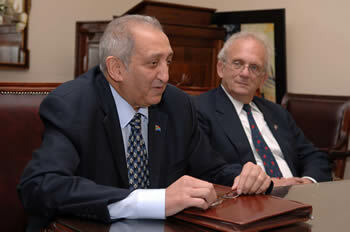 Minister for Minirals and Energy Ramirez and Minister for Minerals and Energy Sonjica sign agreements, 2 September 2008. 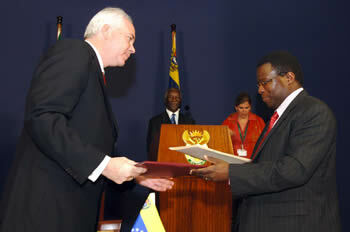 Minister Dlamin Zuma and Minister Maduro sign agreements, 2 September 2008. 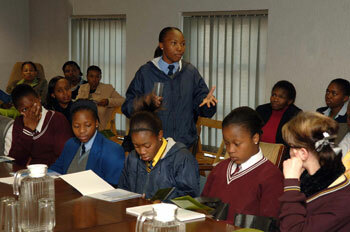 Literacy Week & International Literacy Day Celebrations. 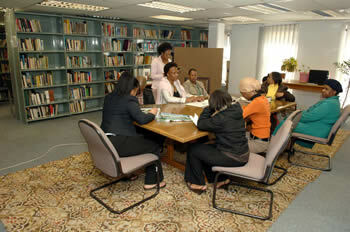 Reading at the Library in the Eikendal Building. 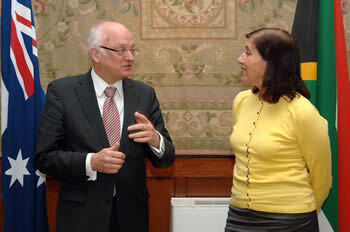 Deputy Minister Sue van der Merwe meets with Australia's Federal Parliamentary Secretary (equivalent to a Deputy Minister) for International Development Assistance Bob McMullan, Union Buildings, Pretoria, 1 September 2008. 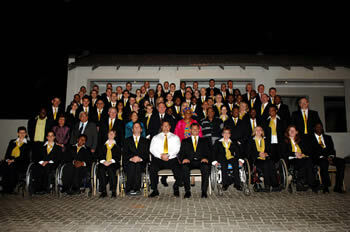 Farewell Gala Dinner for the Paralympic Team, Burchwood Hotel, Boksburg, Johannesburg, 28 August 2008. 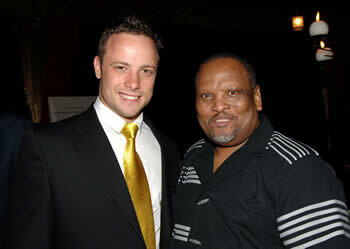 Minister of Sport and Recreation Stofile with Oscar Pistorius, Burchwood Hotel, Boksburg, Johannesburg, 28 August 2008. 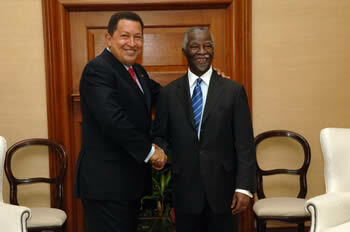 South African President Thabo Mbeki receives Letters of Credence from Heads of Mission accredited to South Africa, Dominican Republic, HE Mr RF Barrientos-Lara. 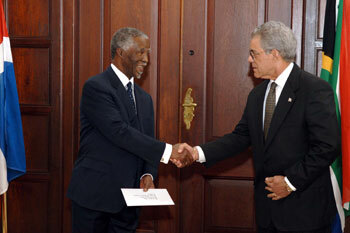 South African President Thabo Mbeki with Head of Mission of Republic of Lebanon HE Mr M Katra accredited to South Africa. South African President Thabo Mbeki with Head of Mission of Saharawi Arab Democratic Republic HE Mr Abd Mohamed Mohamed Yahia accredited to South Africa. 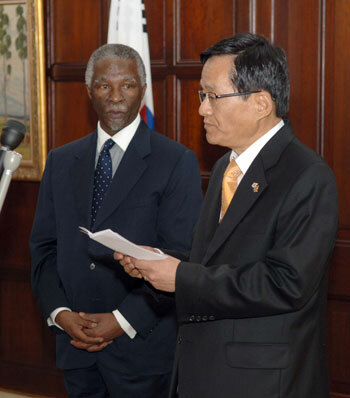 South African President Thabo Mbeki with Head of Mission of Republic of Korea HE Mr Han-soo KIM accredited to South Africa. 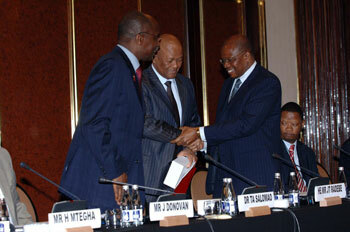 Out going chair of SADC council of Ministers from Zambia Mundia Sikatana inviting RSA to assume chairship. 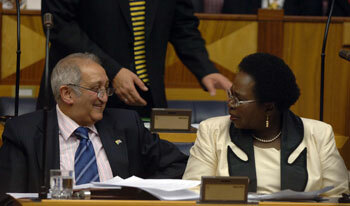 Minister Mphahlwa takes his seat as Minister Dlamini Zuma and Minister Trevor Manuel. 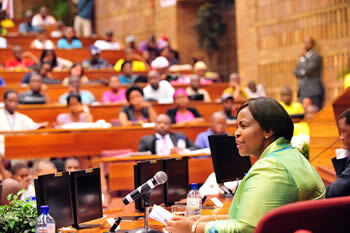 Dr Salomao congradulat Dr Dlamini Zuma as Dr Ntsaluba takes his seat. 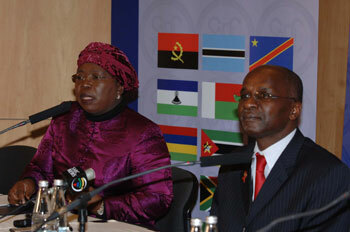 Press briefing by SADC Executive Secretary, Dr Salomao, and Minister of Foreign Affairs, Dr Dlamini-Zuma. 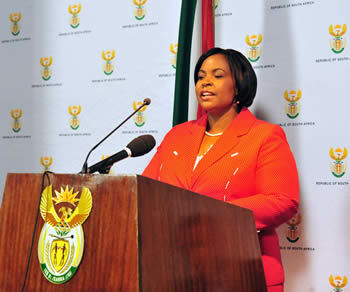 They Briefed the media on Agenda items to be dealt with during the SADC Heads of State Summit to be held at the Sandton Convention Centre in JHB, RSA. Dr Salomao and Dr Khoza greeting Minister Radebe, during Officials meeting leading up to the SADC Summit to be held in Sandton Convention Centre in the middle of this month. Dr Tomas Augusto Salomao breifing officials during Officials meeting leading up to the SADC Summit to be held in Sandton Convention Centre in the middle of this month. 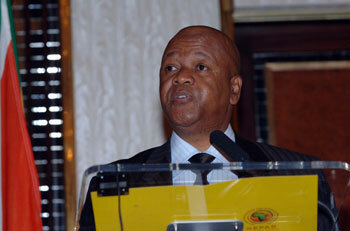 Minister Jeff Radebe breifing officials during Officials meeting leading up to the SADC Summit to be held in Sandton Convention Centre in the middle of this month. 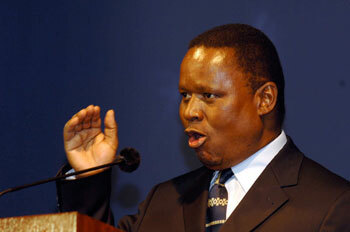 Trade and Industry Minister Mandisi Mpahlwa and Deputy Minister of Foreign Affairs Aziz Pahad will conduct a media briefing on the forthcoming SADC Ministerial and Heads of State and Government Summit. 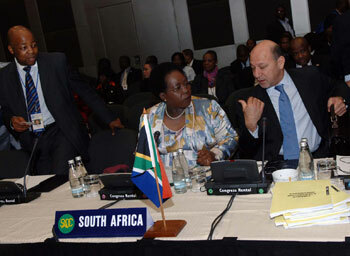 Deputy President of South Africa Phumzile Mlambo-Ngcuka met with Mexico President Felipe Calderon. 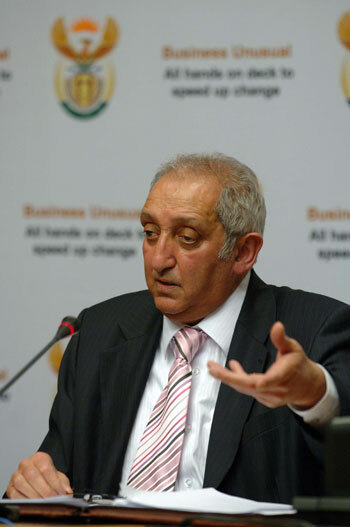 South African Deputy Foreign Minister Aziz Pahad with his Iranian counterpart Deputy Foreign Minister for African Affairs Mohammad Reza Baqeri for political, economic and trade discussions at the Lombardy Hotel in Pretoria. 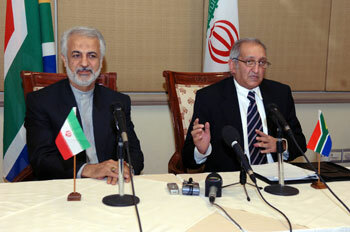 Deputy Foreign Minister for African Affairs Mohammad Reza Baqeri for political, economic and trade discussions briefing media. 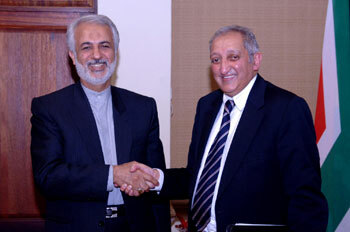 South African Deputy Foreign Minister Aziz Pahad with his Iranian counterpart Deputy Foreign Minister for African Affairs Mohammad Reza Baqeri for political, economic and trade discussions shaking hands. 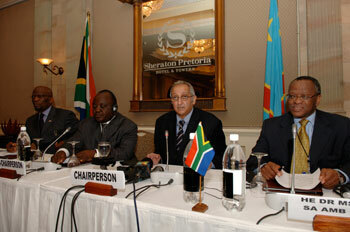 18 July 2008: SADC Ministers to meet today in Durban. Southern African Development Community (SADC) Executive Secretary Mr Tomaz Augusto Salomao briefing media after the SADC Ministerial meeting that took place in Durban. 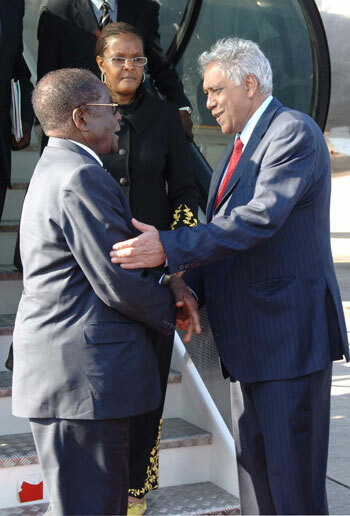 Minister of Foreign Affairs and Chairperson of SADC João Miranda greeting Zimbabwe Foreign Minister Simbarashe Mumbengegwi. 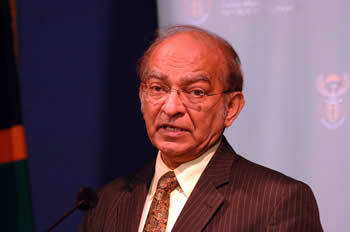 Minister of Foreign Affairs and Chairperson of SADC João Miranda delivering his opening remarks. 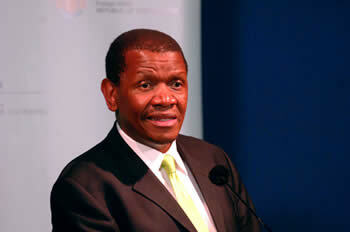 Minister of Foreign Affairs. 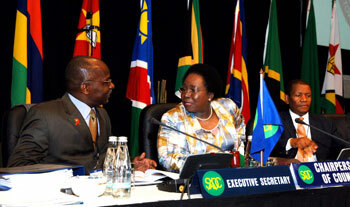 Dr. Nkosazana Dlamini Zuma welcoming delegates at the SADC Ministerial meeting in Durban. 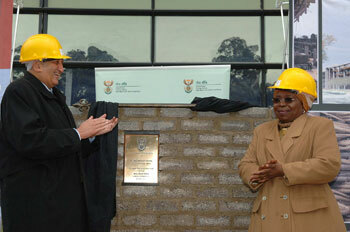 11 July 2008: Remarks by Foreign Affairs Minister Dr Nkosazana Dlamini Zuma at the Brick-Laying Ceremony of the new Foreign Affairs Headquarters, Pretoria. Minister of Foriegn Affairs South Africa, Dr Nkosazana Dlamini Zuma with Deputy Minister of Foreign Affairs Aziz Pahad in front of the new Foreign Affairs Headquarters unveiling a plaque. 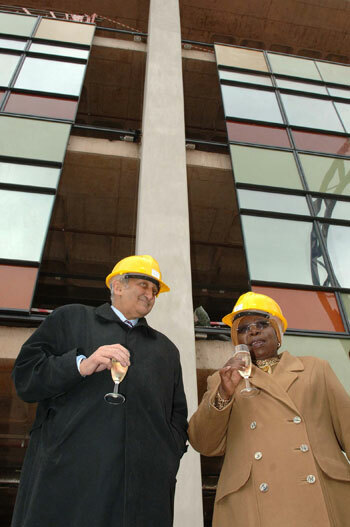 Minister of Foriegn Affairs South Africa, Dr Nkosazana Dlamini Zuma with Deputy Minister of Foreign Affairs Aziz Pahad in front of the new Foreign Affairs Headquarters. 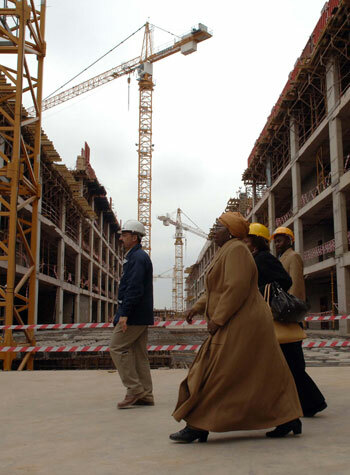 Minister of Foreign Affairs Dr Nkosazana Dlamini Zuma walking about on the new Foreing Affairs Headquarters building site. 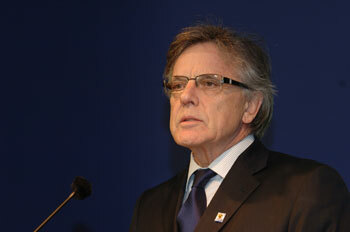 Leading the Minister is Lead Architech Toni Flavio. 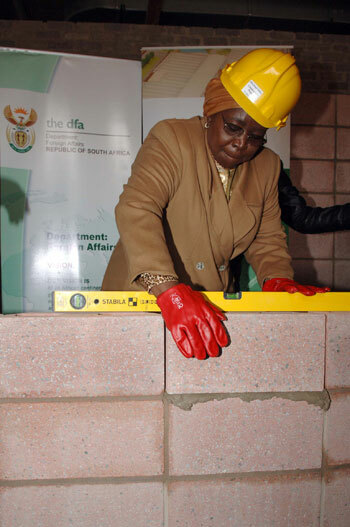 Minister of Foreign Affairs Dr Nkosazana Dlamini Zuma laying a brick at the new Foreign Affairs Headquarters. 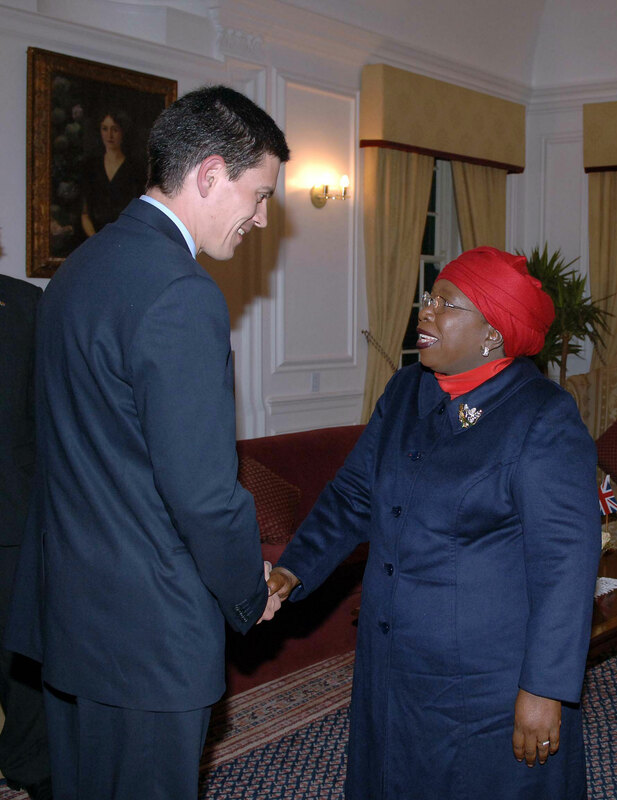 Minister of Foreign Affairs Dr Nkosazana Dlamini Zuma hosts United Kingdom Foreign Secretary David Miliband at the Presidential Guesthouse, Pretoria for Bilateral Discussions, 8 July 2008. 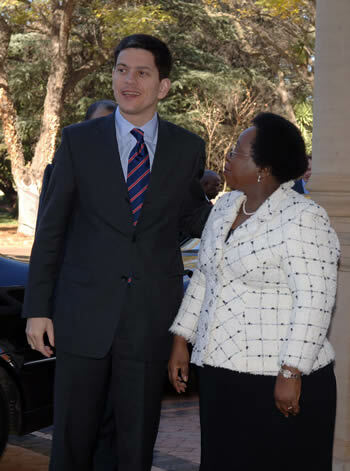 Minister of Foreign Affairs Dr Nkosazana Dlamini Zuma hosting United Kingdom Foreign Secretary David Miliband at the Presidential Guest House, Pretoria. 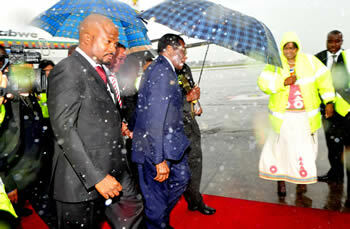 Foreign Secretary Miliband and Amb Mabuza arrive at thew OR Tambo airport. 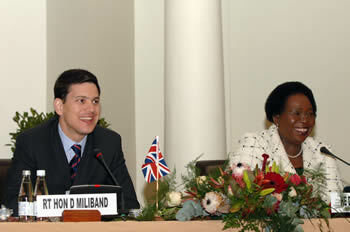 Foreign Secretary Miliband, Amb Mabuza and Amb Boateng share a light moment. 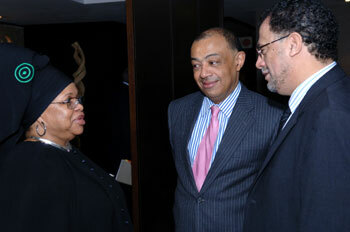 Amb Mabuza, Amb Boateng and 2010 CEO Jordaan chat as the meet at OR Tambo airport. 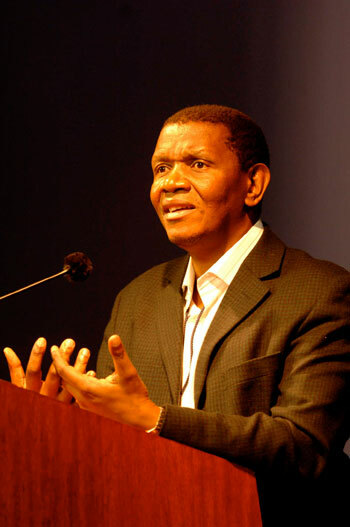 8 Jun: Notes following Briefing to media by Government of Burundi Representative General Everiste Ndayishimiye and Chairperson of the Paliphehutu-FNL Agathon Rwasa, Lanseria Airport, Johannesburg. 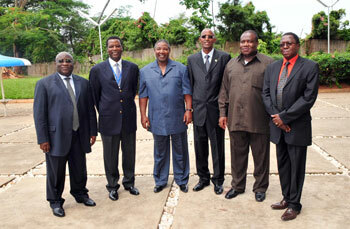 Minister of Safety and Security, Charles Nqakula with a delegation of the government of Burundi and the Paliphehutu-FNL who are in South Africa to participate in 2nd Special Envoys Burundi meeting scheduled from Monday ­ Tuesday 9-10 June 2008. 5 Jun: Notes following Briefing to Media by Deputy Foreign Minister Aziz Pahad, Imbizo Media Centre, 120 Plein Street, Cape Town. 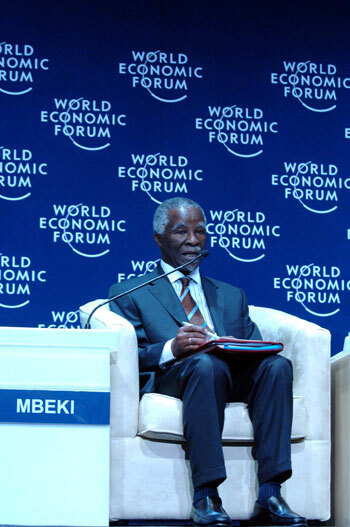 World Economic Forum in Durban ICC, South Africa. 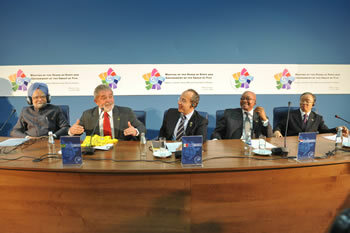 President Mbeki, Mr Schab, President Kufuor, President Odinga, President Mutharinka and President Nkurunziza at the opening plenary of the World Economic Forum. Cape Town ICC. 04 June 2008. 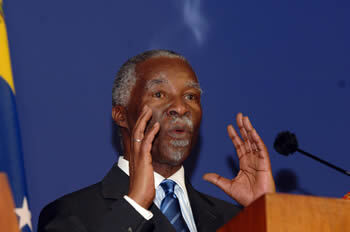 President Thabo Mbeki welcoming deligates to the WEF on Africa in the Cape Town ICC. 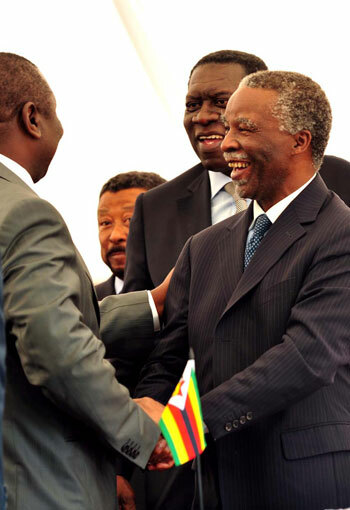 3 Jun: Notes following Joint Press Conference between President Thabo Mbeki and President Umaru Yar’Adua, Tuynhuys, Cape Town. 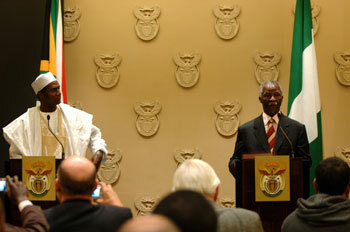 President Thabo Mbeki briefs the media during Nigerian President Umari Yar'adua visit in Cape Town. 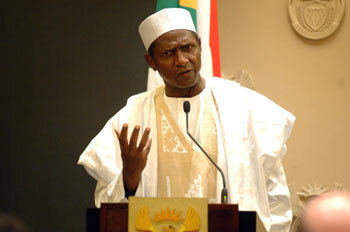 Nigerian President Umari Yar'adua addresses the press briefing in Cape Town. 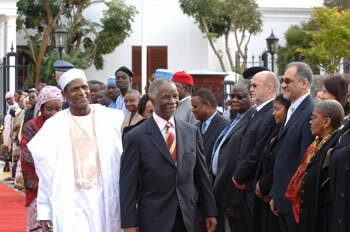 President Thabo Mbeki and Nigerian President Umari Yar'adua addresses media, in Cape Town. 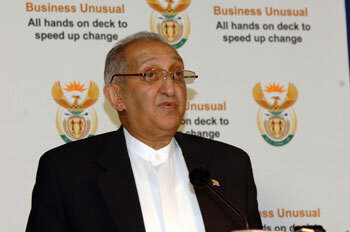 Deputy Minister Aziz Pahad of Foreign Affairs, Briefing the members of the media on the upcoming Nigerian State Visit to be in Cape Town from the 02/06/08 to 04/06/08. Tanzanian Deputy Minister of Foreign Affairs and International Cooperation Mr Seif Ali Iddi says goodbye to Palipehutu FNL Leader Mr Agathon Rwasa as he was to board a South African flight that would take him back home to Burundi. 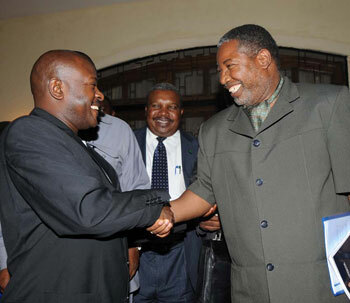 To the right is Minister of Safety and Security of South Africa Mr Charles Nqakula who accompanied Mr Rwasa back to Burundi. 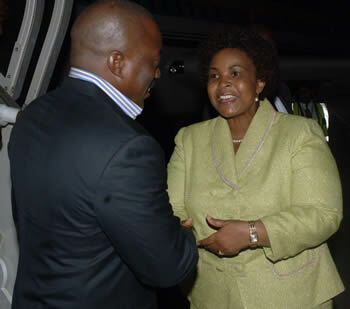 Palipehutu FNL Leader Mr Agathon Rwasa boarding the South African aircraft that would transport him back home to Burundi. Minister of Safety and Security of South Africa Mr Charles Ngacula with Palipehutu FNL Leader Mr Agathon Rwasa onboard the South African flight that took Mr Rwasa back home to Burundi. Palipehutu FNL Leader Mr Agathon Rwasa during a press conference held at Dar es Salaam just before he was to depart back to his country Burundi. Tanzanian Deputy Minister of Foreign Affairs and International Cooperation Mr Seif Ali Iddi, Palipehutu FNL Leader Mr Agathon Rwasa and Minister of Safety and Security of South Africa Mr Charles Nqakula during a press conference in Dar es Salaam, Tanzania. 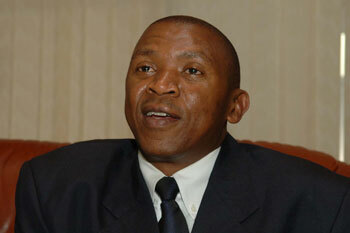 Mr Rwasa was on his way back home being accompanied by South African Minister Nqakula. 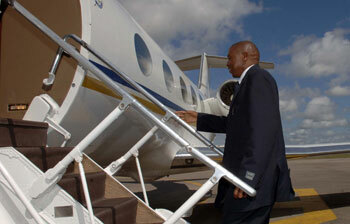 Palipehutu FNL Leader Mr Agathon Rwasa returning home to Burundi. 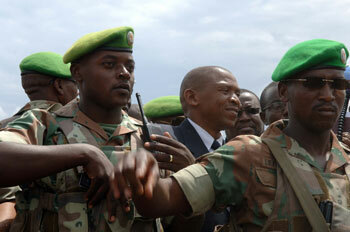 Protected by South African AU forces that is based in Burundi. 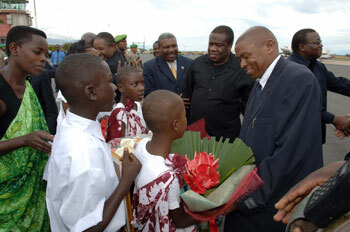 Palipehutu FNL Leader Mr Agathon Rwasa returning home to Burundi. Growds of Burundians welcome him back. 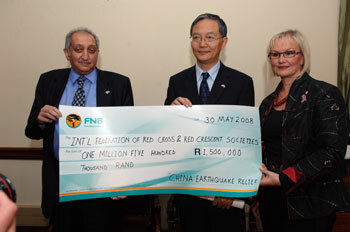 30 May: Notes following Handover of Cheque to International Federation of Red Cross and Red Crescent Societies and Chinese Ambassador, First Floor East Wing, Union Buildings, Pretoria. 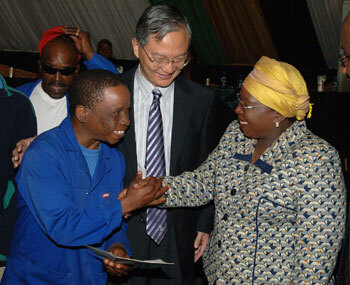 Deputy Minister: Foreign Affairs, RSA Mr Aziz Pahad [Left] handing over a cheque of R1.5mil to the Chinese Ambasador HE Mr Zhong Jianhua [middle] and the represetative of the International Red Cross Ms Seija Tyrninoksa [Right] this morning at the Union Buildings. 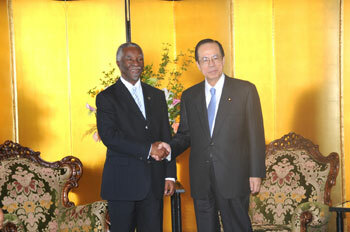 President Thabo Mbeki met with the Prime Minister of Japan, Mr.Yasuo Fukuda, during the Ticad summit in Yokohama, Japan , today, 28 May 2008. 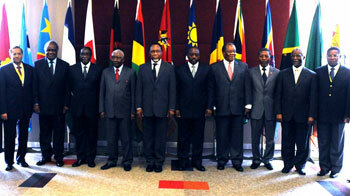 Heads of State pose for a group photograph ahead of the opening ceremony of Ticad in Yokohama , Japan. 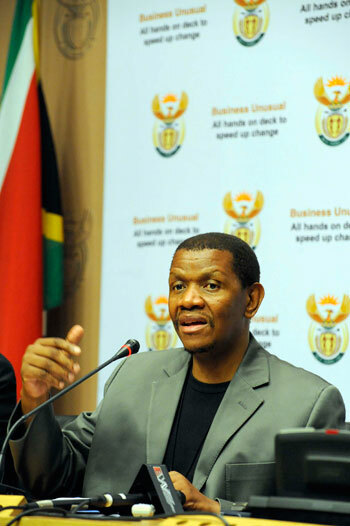 2 9 May: Notes following Briefing to Media by Deputy Director-General Ambassador George Nene Media Centre, Union Buildings, Pretoria. DDG Amb. 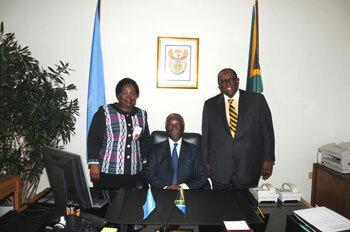 G. Nene speaking to members of the media, JJ [left] and Lehana [center] after a press briefing on the UN-Security council. 27 May: Notes following Briefing to Media by Deputy Director-General Ambassador Gert Grobler Media Centre, Union Buildings, Pretoria. 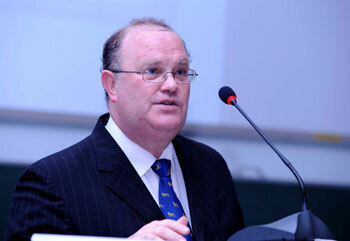 Media Briefing by Amb Grobler to the media on the upcoming SA-EU Troika and the visit byMin. 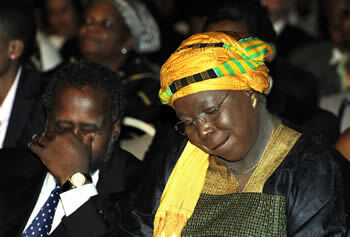 Dlamini-Zuma to Poland. 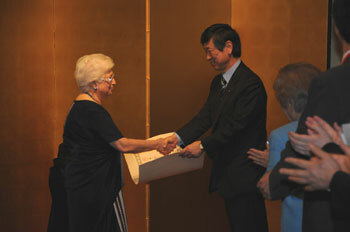 Dr. F. Ginwala had been awarded the Emperor of Japan's prestigious award " Grand Cordonof the order of the Rising Sun(Rank One ) in Yokohama , Japan on 27 Mat 2008 by teh Foreign Minister of Japan, Mr. Koumura. 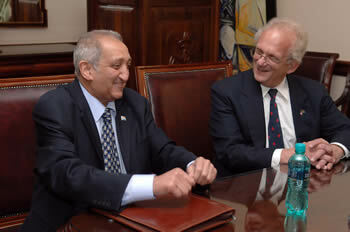 18 May: Deputy Minister Pahad to hold Discussions with Syrian Foreign Minister. 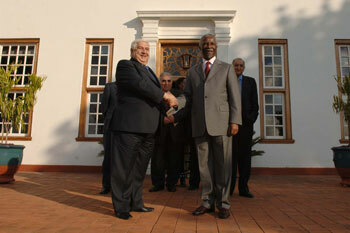 President of South Africa, Thabo Mbeki recieving a courtesy call from Syrian Foreign Minister and Special Envoy of President Assad, Walid Al Moalem at Mahlamba Ndlophu, President's house in Pretoria. 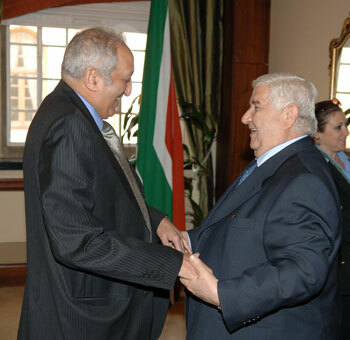 Deputy Minister of Foreign Affairs South Africa, Mr Aziz Pahad shaking hands with Syrian Foreign Minister and Special Envoy of President Assad, Walid Al Moalem at the Union Buildings in Pretoria. 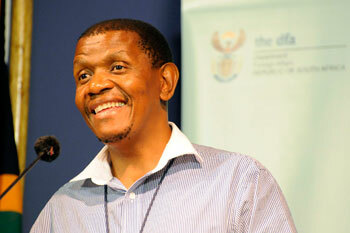 14 May: Notes following IRPS Cluster Media Briefing, Imbizo Media Centre, 120 Plein Street, Cape Town. Deputy Minister Pahad Briefing Media at IRPS Cluster. 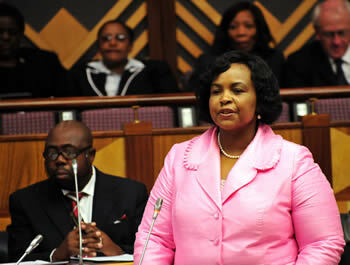 13 May: Budget Vote Speech of the Minister of Foreign Affairs, Dr Nkosazana Dlamini Zuma, to the National Assembly. Minister of Foreign Affairs Dr Nkosazana Dlamini Zuma and Deputy Minister Aziz Pahad delivering the Departments Budget Vote Speech at Parliament. 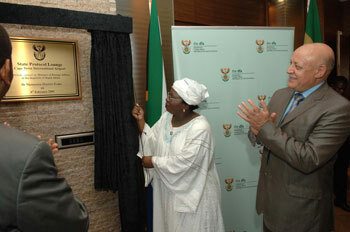 Minister of Foreign Affairs of South Africa, Dr Nkosazana Dlamini Zuma unveils a plaque at the new State Protocol Lounge at OR Tambo International Airport, 8 May 2008. 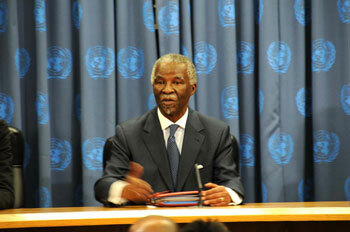 President Mbeki addressing the media after the debate at the Security Council in New York. 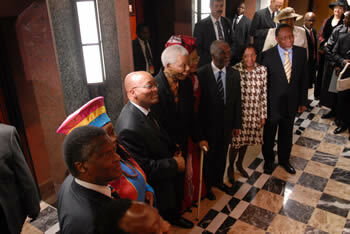 Dr Nkosazana Dlamini Zuma , Minister of Freign Affairs , President Mbeki and Ambassador Dumasani Kumalo at the office of the President of the Security Council. General Secretary of the UN - Mr. Banki Moon addressing the heads of State and guests at the Security Council in New York. 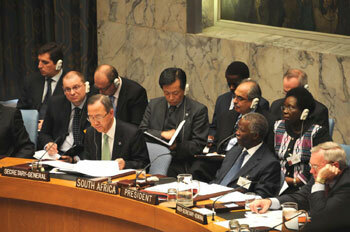 President Thabo Mbeki Addressing the Security Council at the UN in New York. 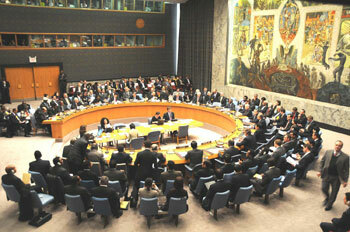 South Africa held the Presidency of the Security Council for April 2008. 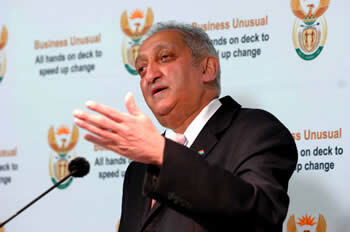 Deputy Minister of Foreign Affairs SA, Aziz Pahad during a press conference on Zimbabwe issues, Kenya and upcoming visit to Mauritius by President Thabo Mbeki. 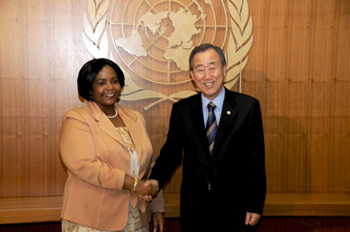 15 Apr: Notes following Briefing by the Director General of Foreign Affairs Ayanda Ntsaluba on South Africa’s Presidency of the United Nations Security Council. 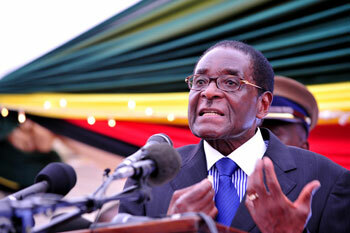 Minister Mafumadi briefing the media on the current issue of the Zimbabwe elections. 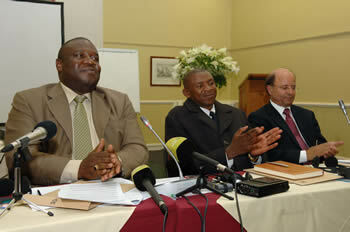 Minister Mafumadi and the Rev Chikane during the briefing on the current issue of the Zimbabwe elections. 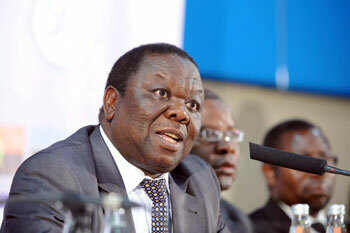 Rev Chikane briefing the media on the current issue of the Zimbabwe elections. 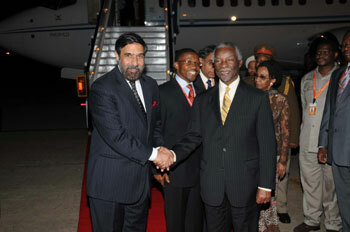 President Thabo Mbeki arrrived in New Delhi ahead of the Heads of State Summit of the India - Africa summit. 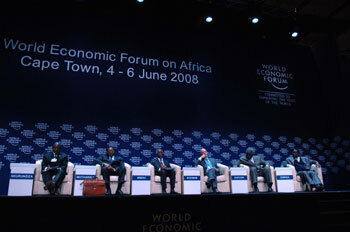 Africa Summit in New Delhi -India today, 7th April 2008. 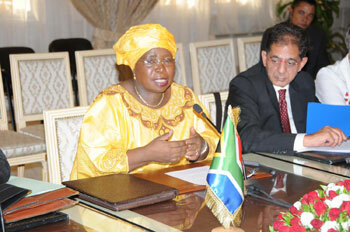 Minister Nkosazana Dlamini Zuma met with her counterpart Mr. Anand Sharma , Minister of State of India in New Delhi ahead of the India Africa Summit. 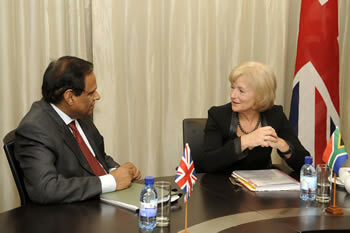 07 Apr: Deputy Minister Sue van der Merwe to hold Discussions with the UK Minister of State for Commonwealth, Dr Kim Howells. 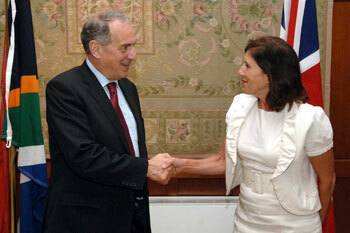 Deputy Minister of Foreign Affairs, Sue van der Merwe meeting with her United Kingdom counterpart Kim Howells. 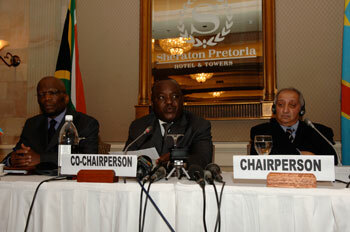 2 - 3 Apr: Joint Communiqué of the Fifth Session of the Republic of South Africa - Democratic Republic of Congo Bi-National Commission (BNC), held in Pretoria. 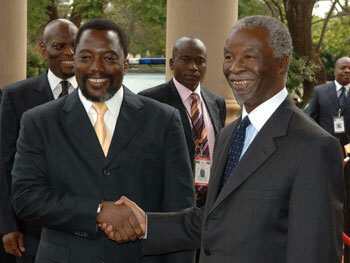 South African President Thabo Mbeki with Democratic Republic of the Congo President Joseph Kabila during the arrival outside the Presidential Guesthouse, Pretoria. 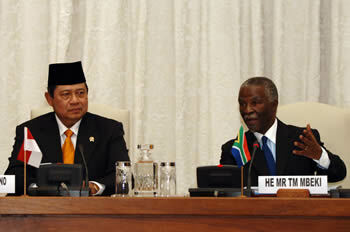 South African President Thabo Mbeki and Democratic Republic of the Congo President Joseph Kabila during a press conference. Deputy Minister of Foreign Affairs giving opening remarks as Republic of South Africa Amb to the Democratic Republic of Congo listens seated on his left. 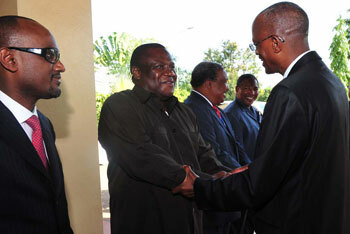 On his immediate right is the DRC Foreign Minister and the Democratic Republic of Congo Amb to Republic of South Africa. 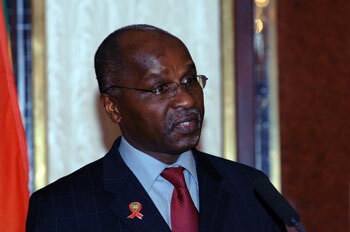 Democratic Republic of Congo Foreign Minister giving opening remarks . 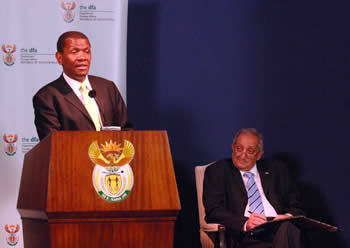 seated on his left is Republic of South Africa Deputy Minister for Foreign Affairs and on his right is Democratic Republic of Congo Amb to Republic of South Africa. 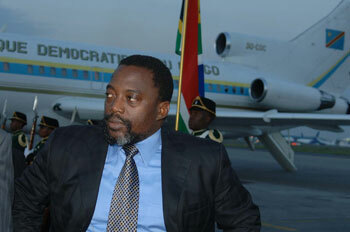 President Joseph Kabila arrives at OR Tambo International Airport, Johannesburg, South Africa ahead of the SA-DRC Joint Commission to be held in Pretoria. 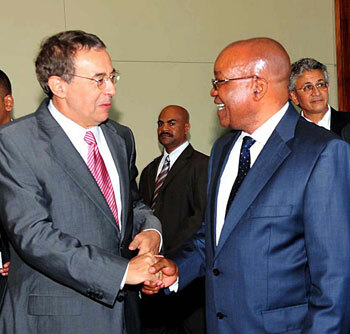 02 Apr: Notes following Briefing on South Africa’s Presidency of the UN Security Council by Ambassador George Nene, Wednesday 2 April, Union Buildings, Pretoria. 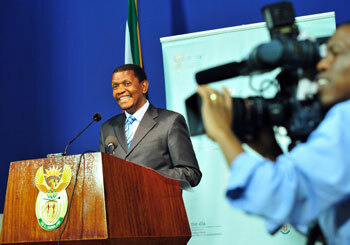 Amb George Nene brief the media on the RSA presidency of the UN-Security council. 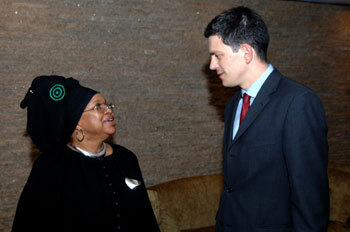 20 – 21 Mar: Minister Dlamini Zuma to attend the Preparatory Meeting for TICAD. 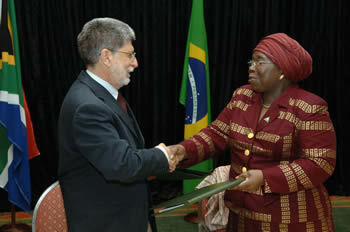 Dr Nkosazana Dlamini Zuma at the Ticad meeting in Gabon. 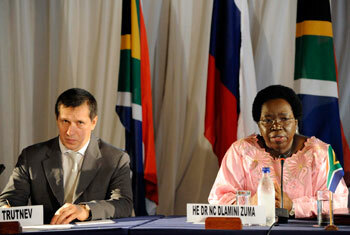 25 Mar: Minister Dlamini Zuma in Chile to boost Economic Ties. 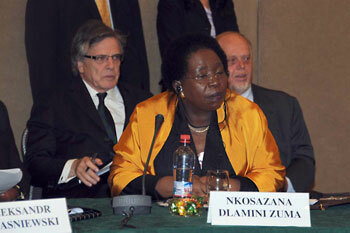 Dr Nkosazana Dlamini Zuma attends the meeting of the Socialist International Sustainable World Society Commission in Santiago, Chile. 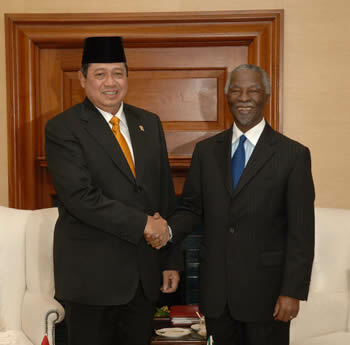 South African President Thabo Mbeki with Indonesian President Susilo Bambang Yudhoyono in Pretoria during President Yudhoyono's official state visit to South Africa. 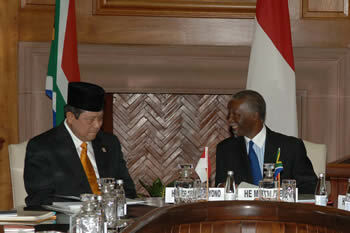 The Presidents also signed a MOU (Memorandum of Understanding) on future relationships between the two countries, 17 March 2008. 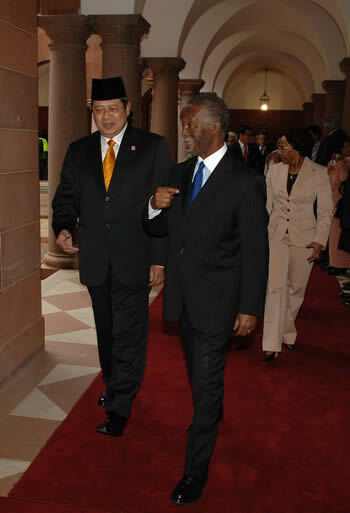 President of South Africa Thabo Mbeki with Indonesia President Susilo Bambang Yudhoyono at the Union Buildings Pretoria, South Africa, 17 March 2008. 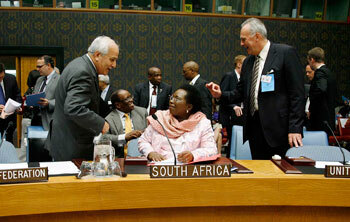 04 March 2008: Notes Following Weekly UN Security Council Briefing by Mr Xolisa Mabhongo Deputy Head of Multilateral Affairs, Union Buildings, Pretoria. 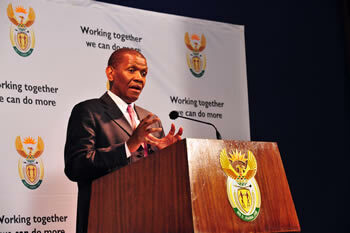 Deputy Head of Multilateral Affairs at Foreign Affairs Mr Xolisa Mabhongo brief media on UN Security Council issues.